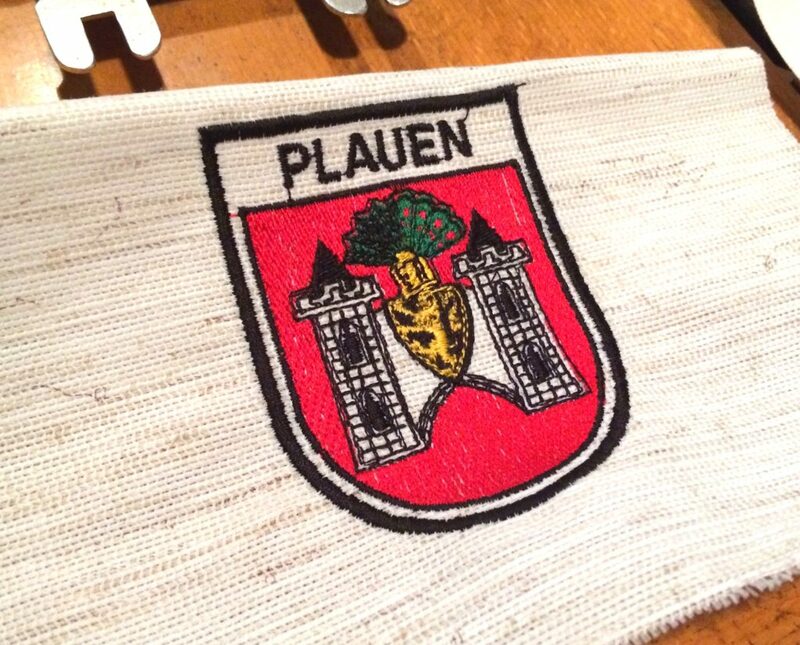 Plauen Germany is where my grandfather, Kurt William Leucht, lived from about the age of 4 until he left for America at age 18. 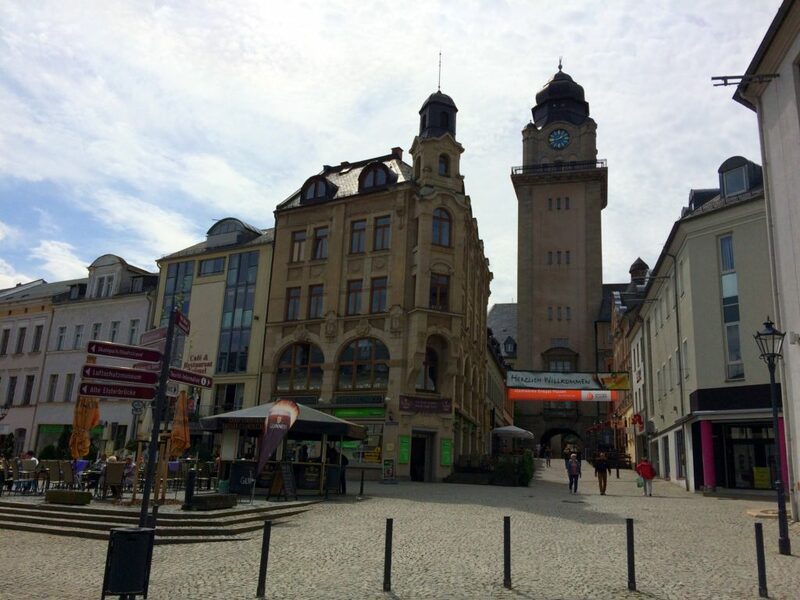 Here are some more sights from Plauen as I explored the area and walked in my grandfather’s footsteps. The Peace Bridge (Friedensbrücke) is a stone arch bridge built in 1905. The longest span is 90 meters which is nearly 300 feet. 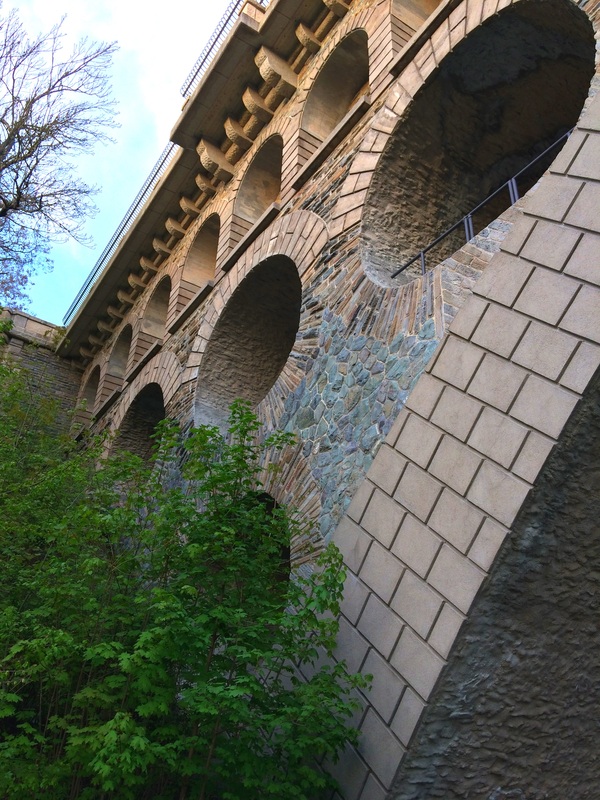 It’s one of the largest stone arch bridges in the world! There are no older bridges in the world containing this long of an arch span! My grandfather was 9 years old when the bridge construction was finished, so I’m certain he would have marveled at this monster. He lived less than one mile (1.6 km) from this bridge, so he must have at least walked across it and under it as a teenager. Here’s what the bridge looked like in 1906. And here are a few photos that I took of the bridge while I was there. It’s really quite impressive. Especially when you consider when it was constructed. It’s quite difficult to get a photo of the entire bridge. It’s really big and there are lots of trees in the area. The bridge is quite beautiful. The design is very organized and geometrical, but it also has some random elements mixed in. 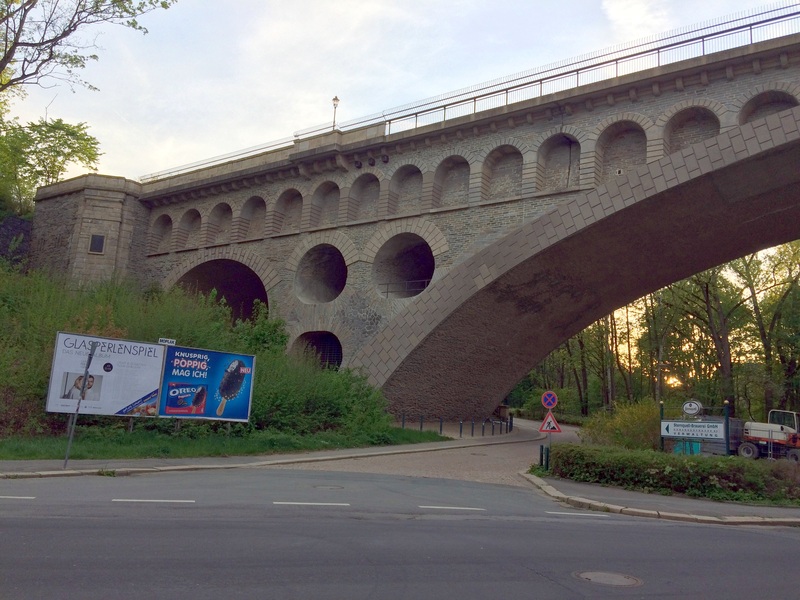 The bridge was badly damaged during the war, but it was restored quickly, even though that took a lot of the limited resources that were available to Plauen after the war. 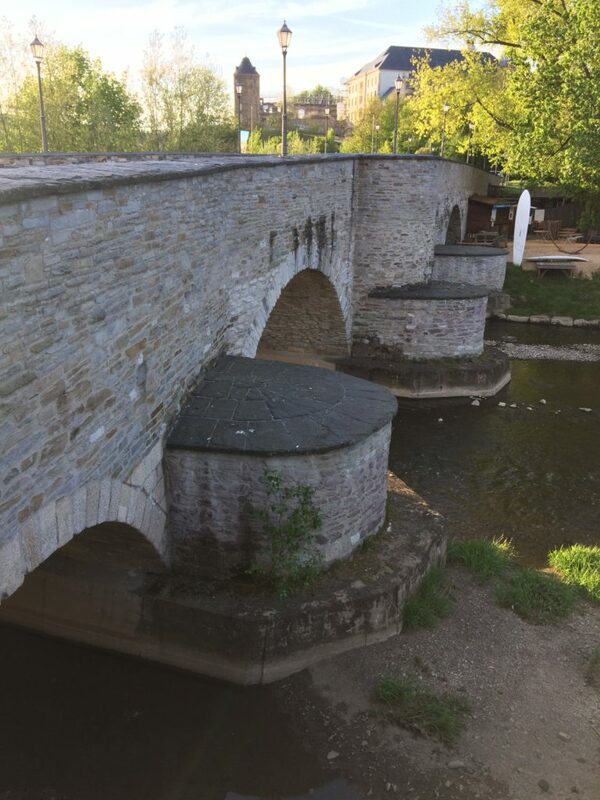 The Old Magpie Bridge (Alte Elsterbrücke) near downtown Plauen is the second oldest stone bridge in Saxony and one of the oldest in Central Europe. It was first mentioned in documentation from 1244. 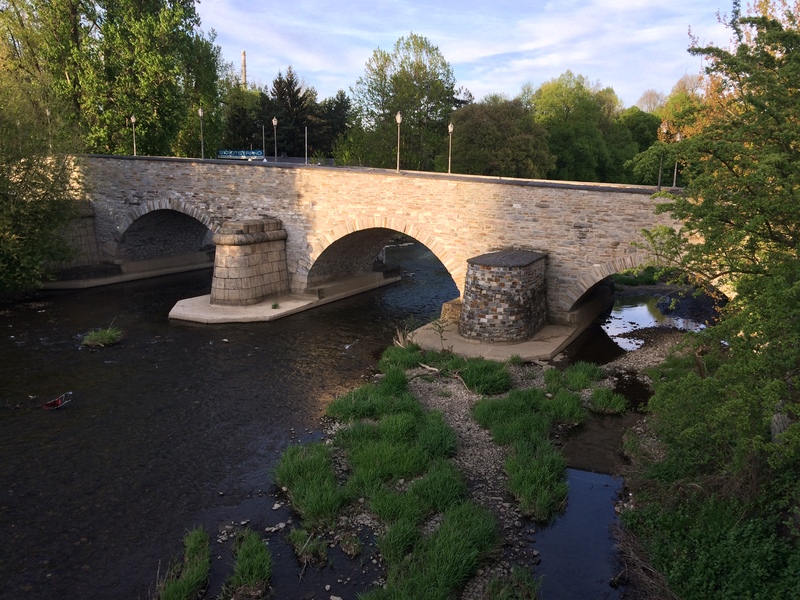 The bridge has gone through many restorations over these many years. You can definitely pick out some sections that are more modern than others. 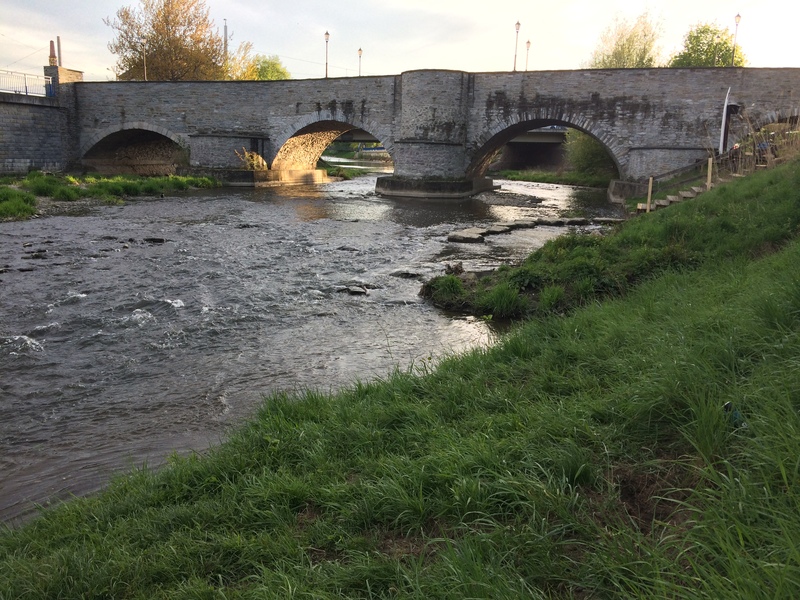 My grandfather lived about 2 miles (3.2 km) from this old bridge. It’s a pretty neat bridge and it’s amazing how old it is and that it’s still standing. 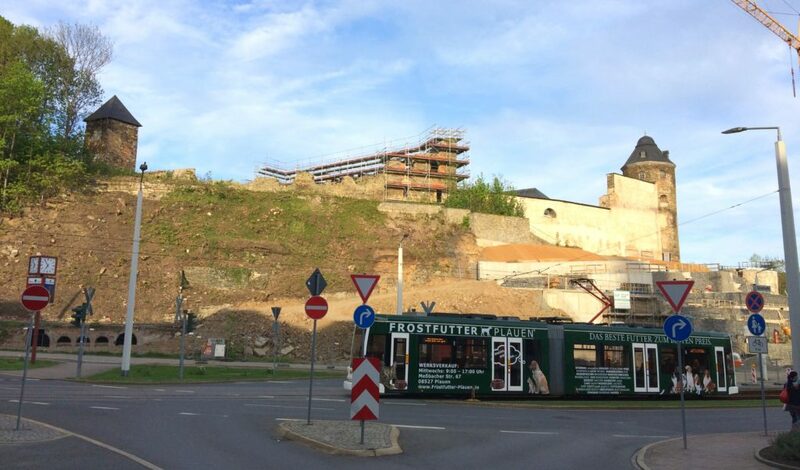 Just one block from downtown Plauen and one block from both town squares, overlooking the entire town, sits this old fort or castle. I’m not sure which. It’s obviously under restoration right now. But I didn’t see any signage and I can’t find any information on the Internet about it either. Strange. Whatever it is, it looks pretty awesome. And some of it is buried in what appears to be a hillside. But underneath that dirt, looks to be some really old walls and rooms. This was all completely fenced off for construction, so I couldn’t explore. I’m interested to find out the history of this structure and what exactly tourists in the future will be able to see and explore. 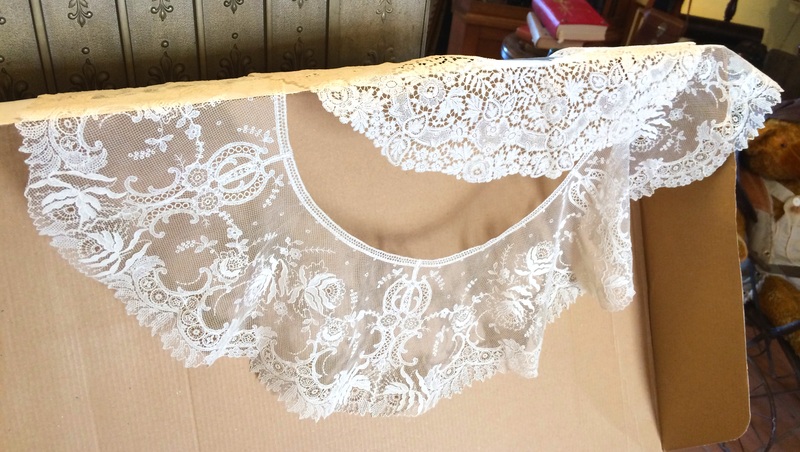 After graduating [high school], I obtained a job with Otto-Baum & Son, who manufactured and exported lace. I’m not exactly sure what type of work he did or how long he did it, though. 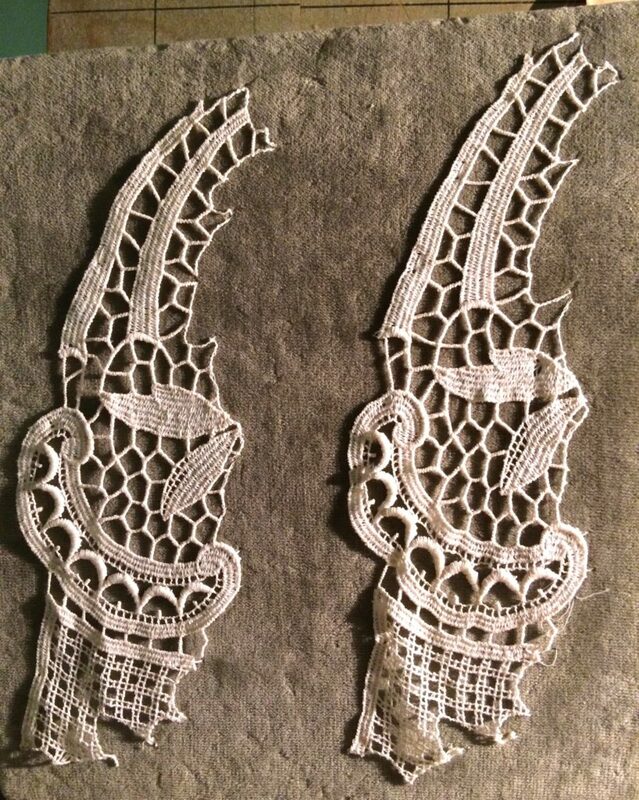 While I was in Plauen, I was unable to find any listings or address for this Otto-Baum & Son company, but I’m guessing that in 1913 or 1914, when my grandfather was 17 or 18 years old, small family run lace businesses were all the rage. 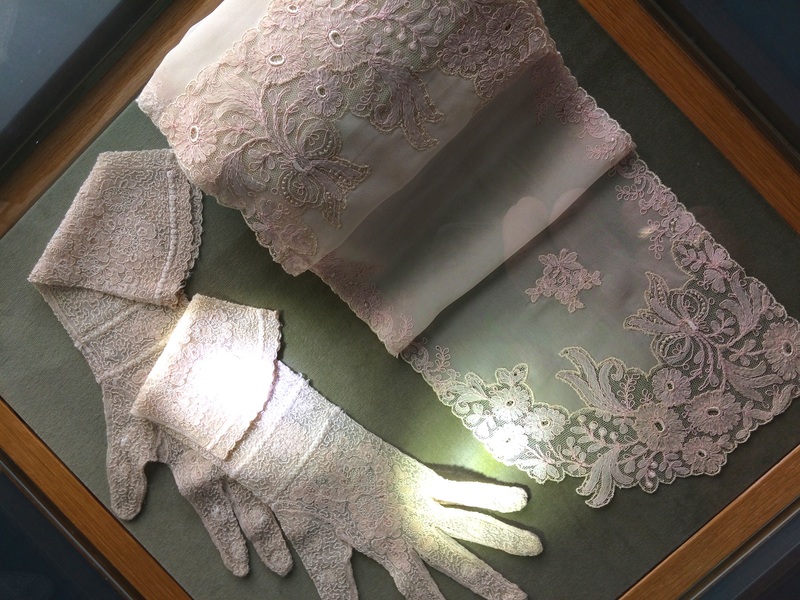 The population of Plauen actually peaked in 1912 due to the textile and lace industry there. 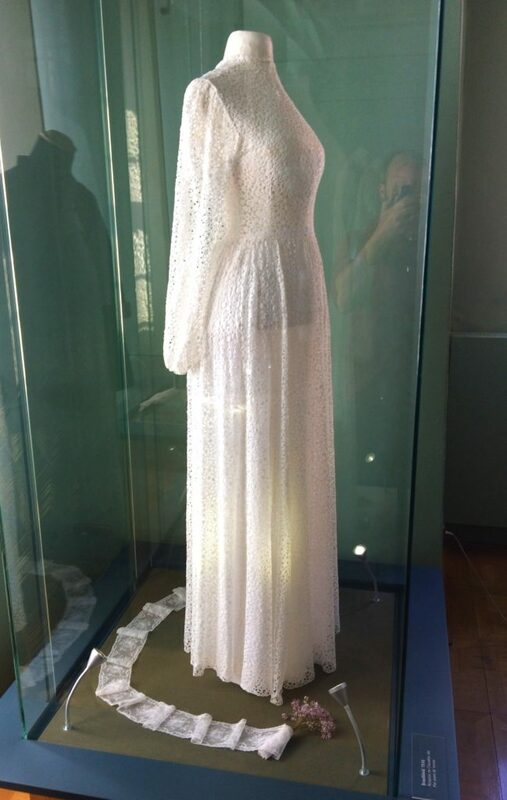 And some amazing clothing items too. I’m guessing that this is a tablecloth. Very cool. And the display case is also quite impressive! As a dude, and also as an engineer, I was most excited to gaze at the old antique lace making machinery, as opposed to looking at the actual antique lace samples on display. But I believe that guys and gals alike can both appreciate this historical local museum. 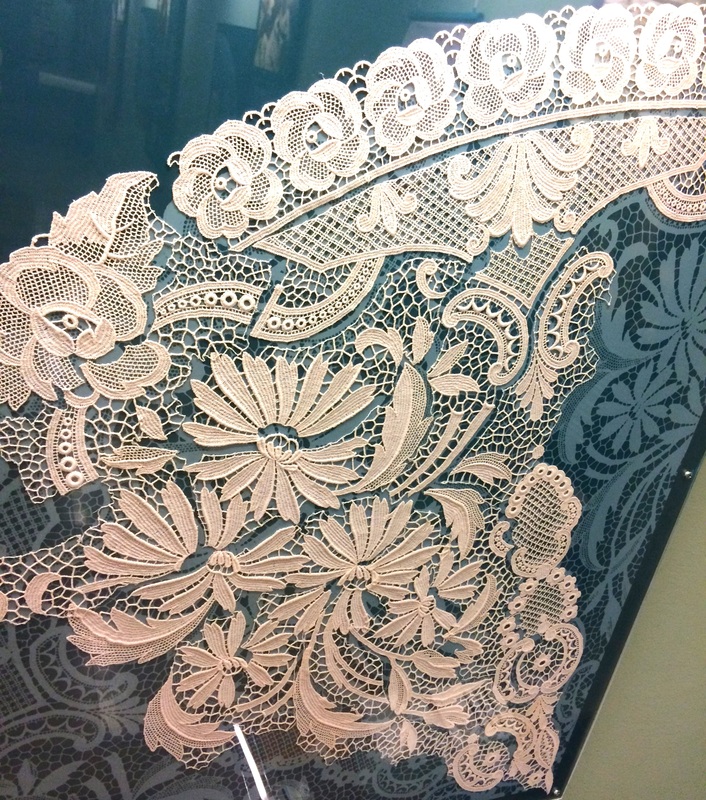 So this machine apparently pumped out copy after copy of the same small lace pattern segment. 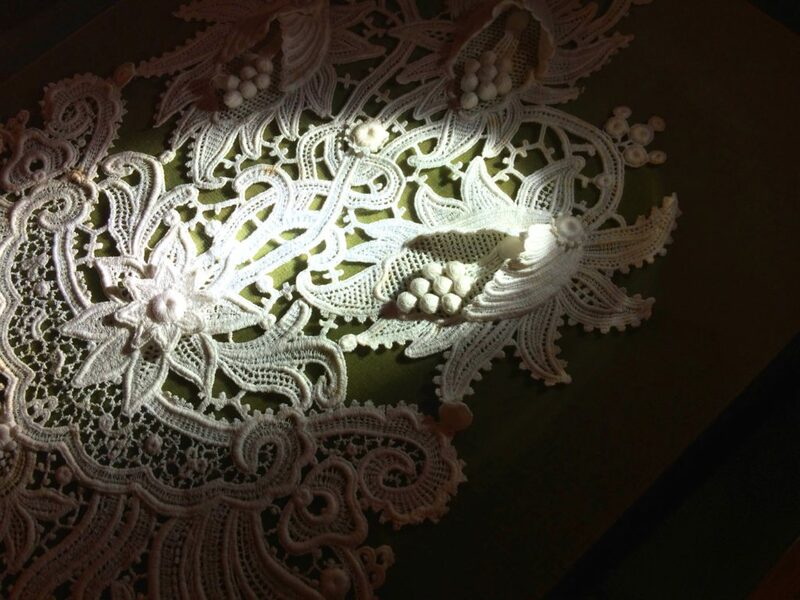 Here are some examples of the small lace pattern segments so you can see what the machine above produced. These examples are about 6 inches tall or so. This is the same example, but much closer so you can see the detail. 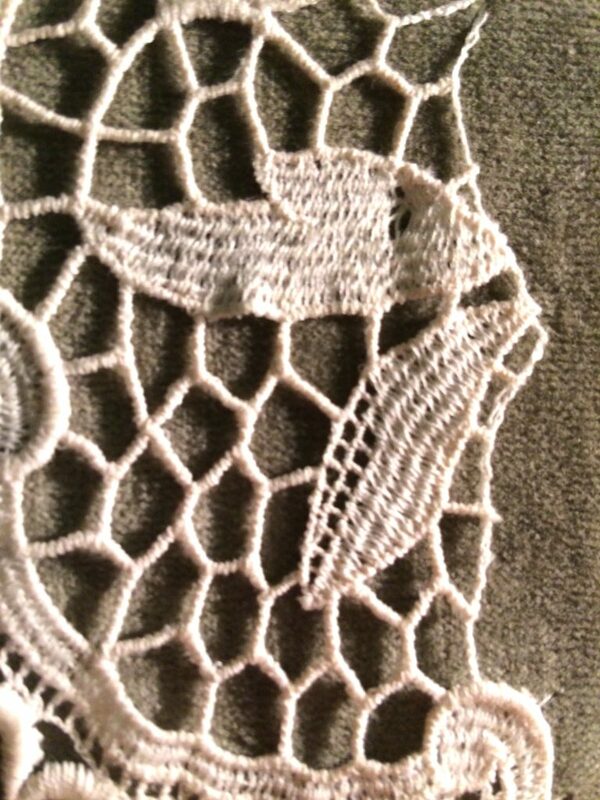 Basically this detail area contains two leaves with decorative honeycomb-like ribbing. Each leaf is about 3/4 of an inch. Pay close attention to the very short ribs on the right that are spanning between the two leaves. 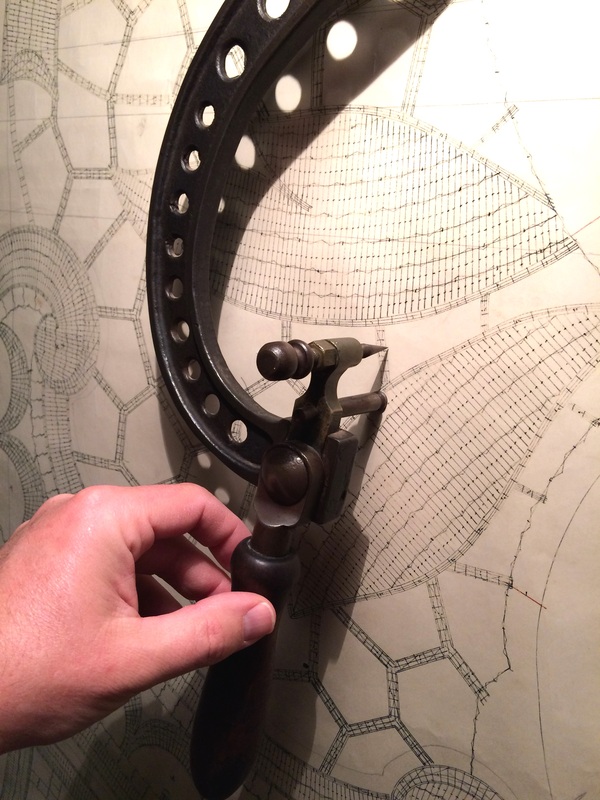 This is the hand-drawn pattern that the operator used to “program” or to drive the giant machine. The leaves which are actually less than an inch long in real life are about 8 or 10 inches long on this pattern. And the tiny little, just a few millimeters long, ribs that span between the two leaves are an inch or more long on this pattern. This display shows an example of how some of the lace products had to be stitched together by hand from numerous smaller sections, like a puzzle. 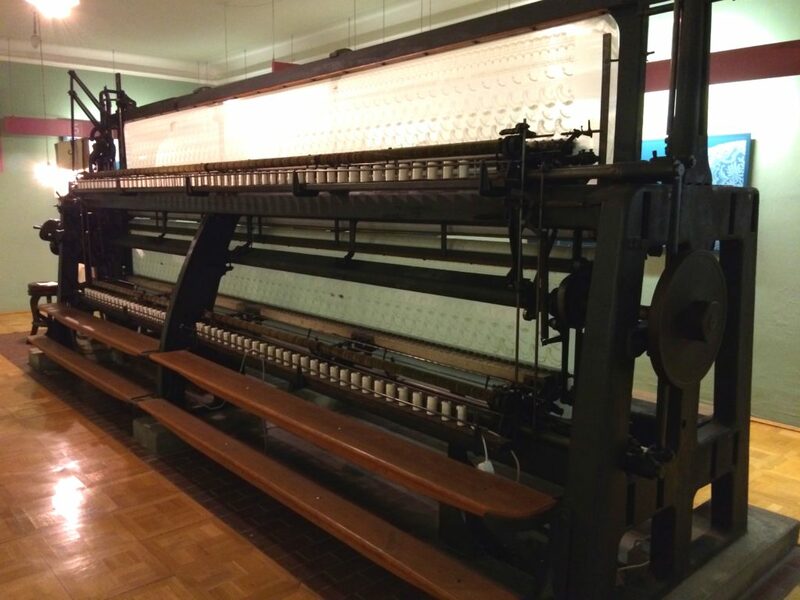 Here is a smaller and portable automated lace making machine. You can see the “programming” of this machine was performed by the long roll of punched paper tape. 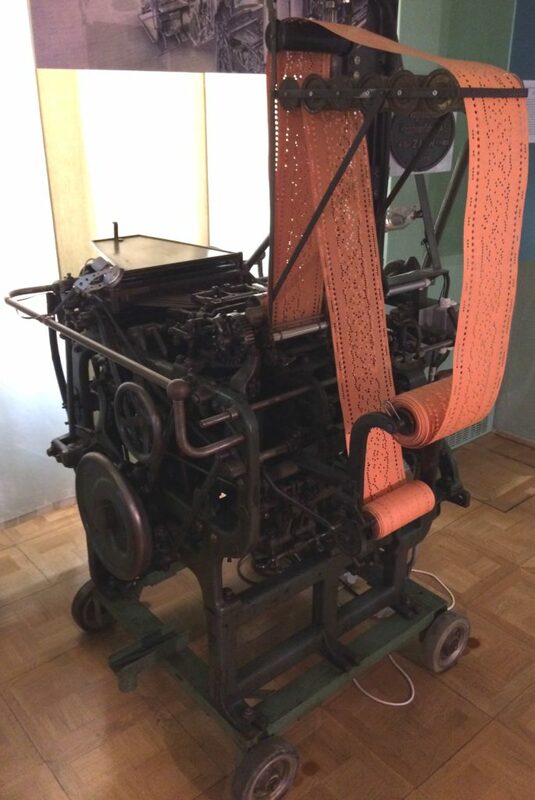 Surprisingly, this punched tape programming technique had been used on looms for over a hundred years. 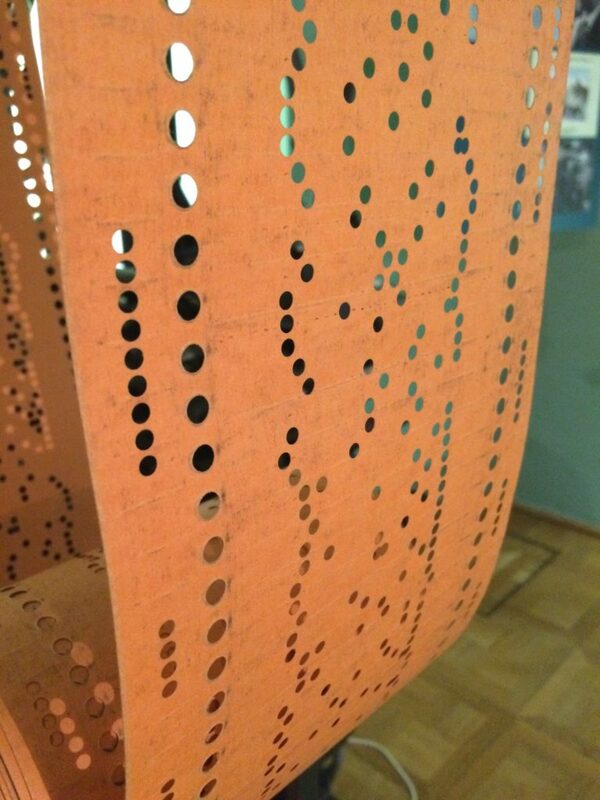 The punched tape has holes in it that tell the machine which needles to move up and down and when to do so. 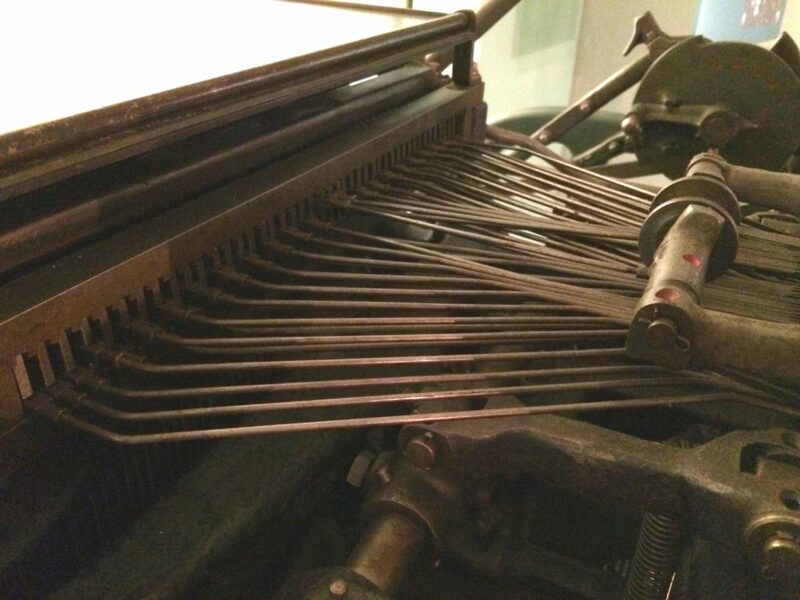 Here is a close up shot of the linear array of sewing needles on this portable machine that were programmed by the punched tape. I thought this photo was cool so I took a picture of it. 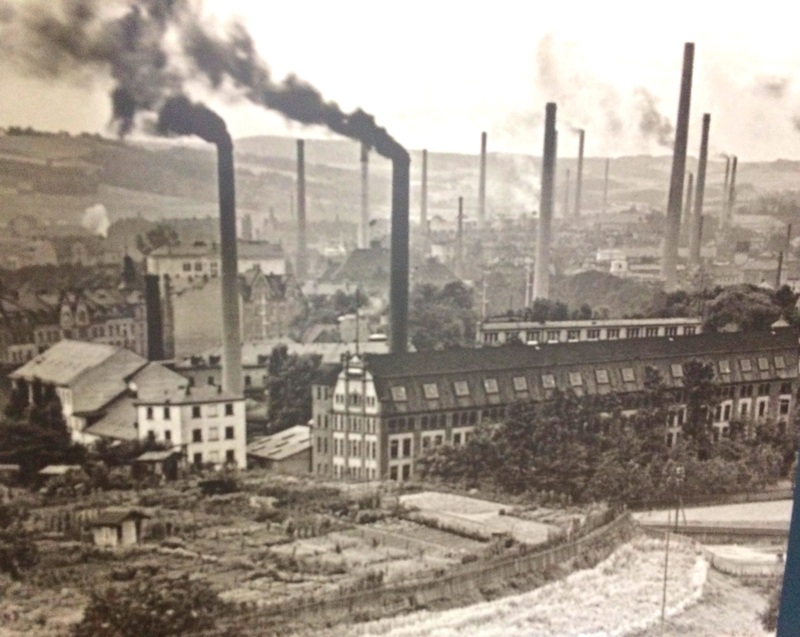 This photo shows the prevalence of factories in Plauen at the height of the textile and lace manufacturing boom. This display was pretty neat. 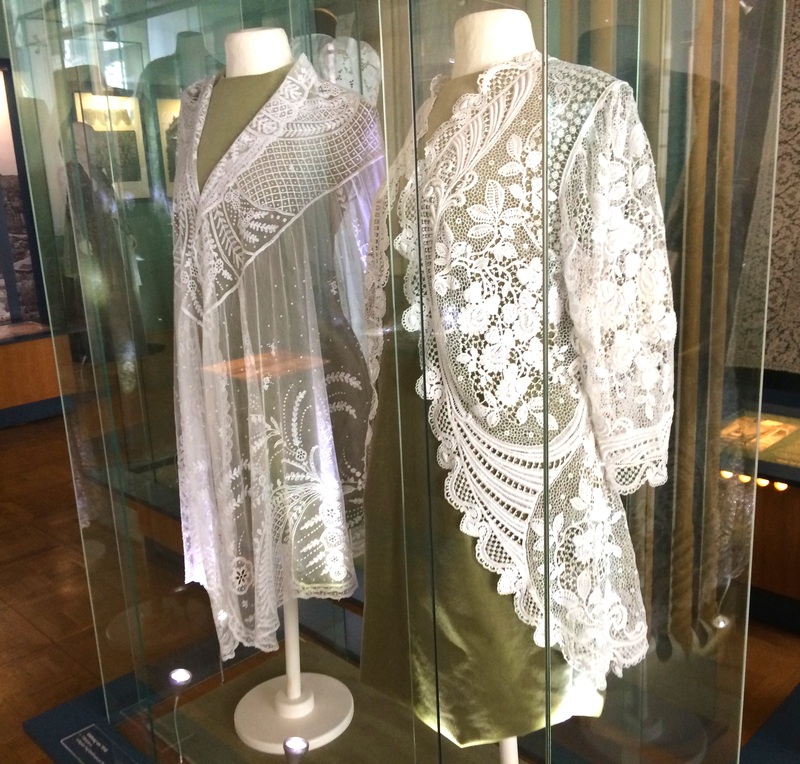 This particular lace example is very very textured and even three-dimensional. Amazing. 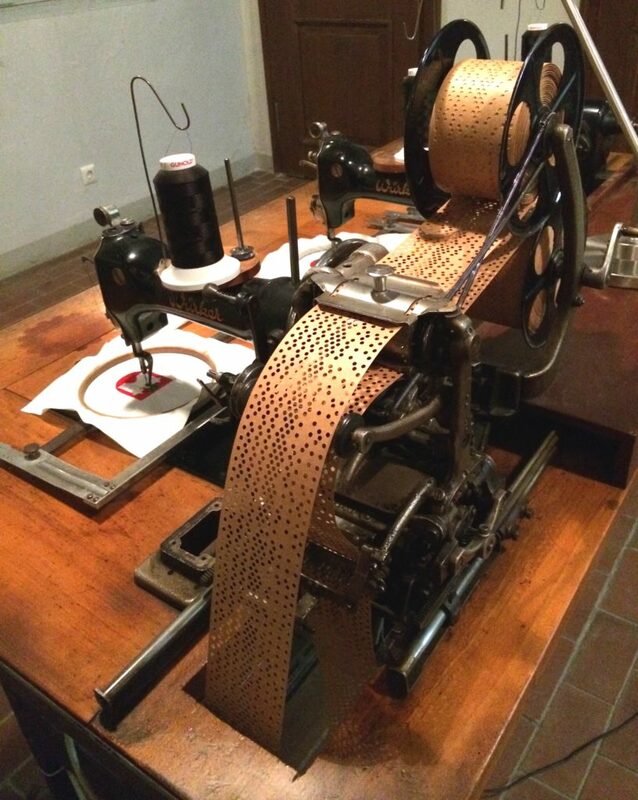 And here is an example of an antique and automated embroidery machine. From this angle, it looks basically like an old sewing machine. 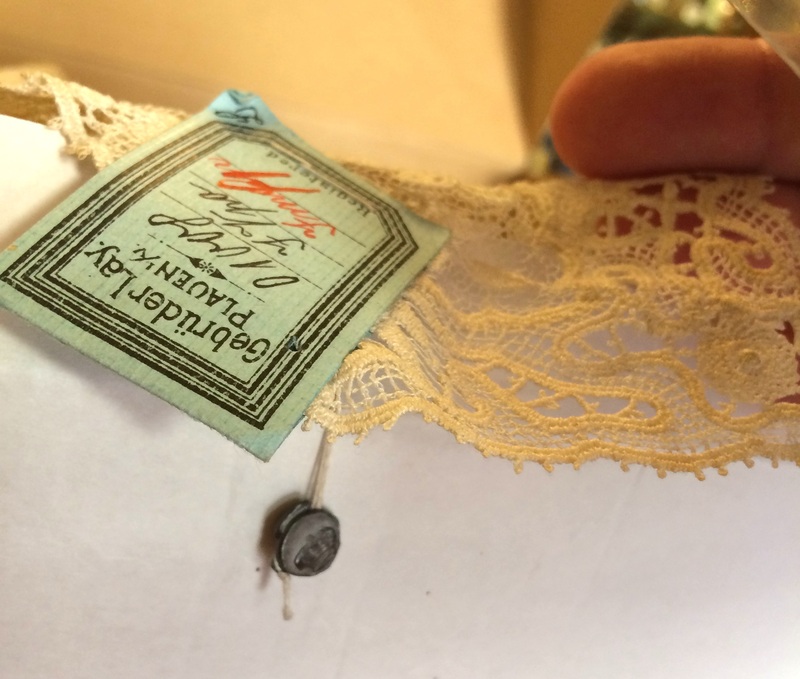 But from this angle, you can clearly see the punched paper tape roll that is fed through the machine to move and control the stitching action. 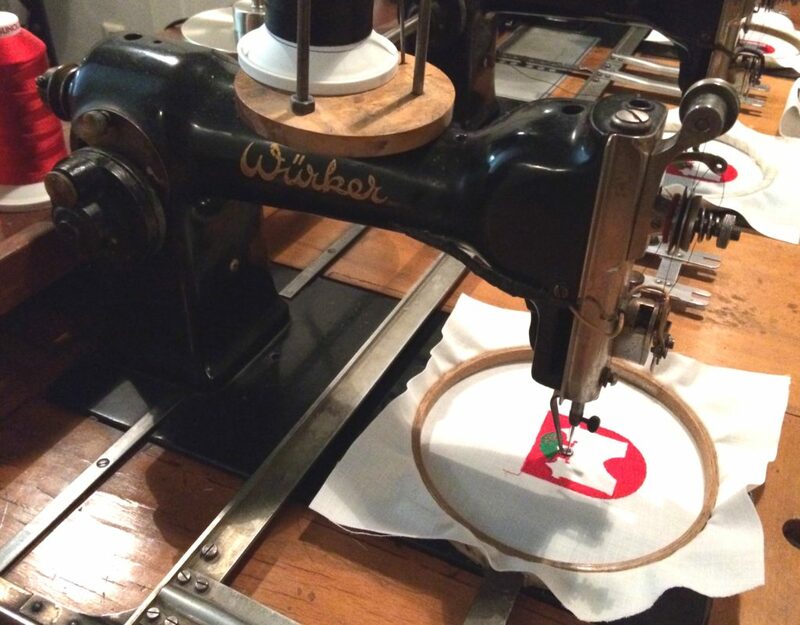 I think the sewing machine stays stationary and the hoop with the fabric gets moved around. Pretty cool. And here is the final product from the automated embroidery machine. Very nice. Especially for the time period that this technology was invented and used. 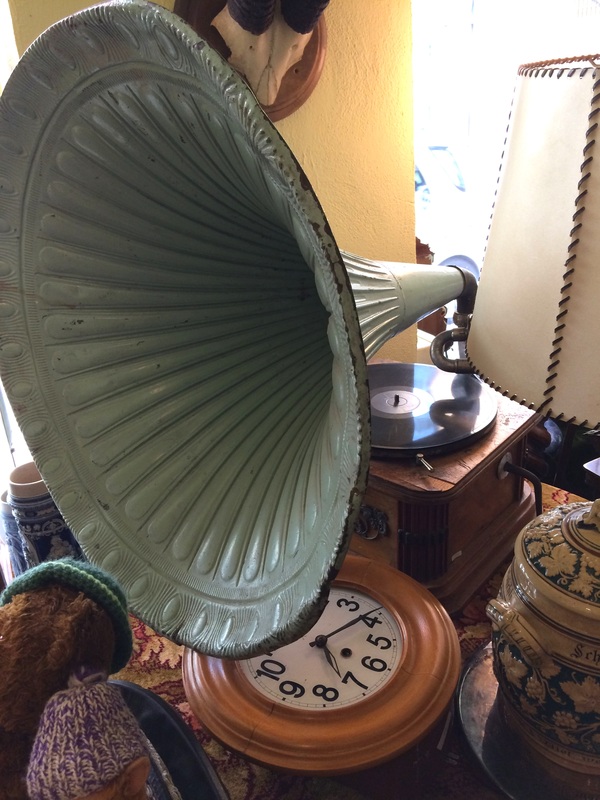 I passed a nice looking local antique store on my way to the town square and I thought it would be fun to check it out and to look for some items that were from the time my grandfather was living in the area. I considered buying a piece of lace from the early 1900’s, but they were all out of my price range. This antique store had several beautiful samples, though. I think they were from the worlds fair or something like that. Check out the cool lead seal with the crown embedded in it. That dates it before the first world war, I think the store owner told me. We arrived at 9:00. We were invited to board the ship “Vaterland”. […] We noticed that hundreds of people were waving their handkerchiefs and shouting farewell greetings to us. We did the same. […] The German homeland disappeared in the distance. […] At 3:00 the call to coffee came. After that, there was more activity on deck. Music was made with an accordion, while some Bohemian country people were performing their dances. […] At 7:00, the bells chimed for the evening meal. It became stormier and the ship swayed a little. Despite the disturbance, there was still dancing on the deck. I added to the concert with my harmonica. I went to bed at 11:00. 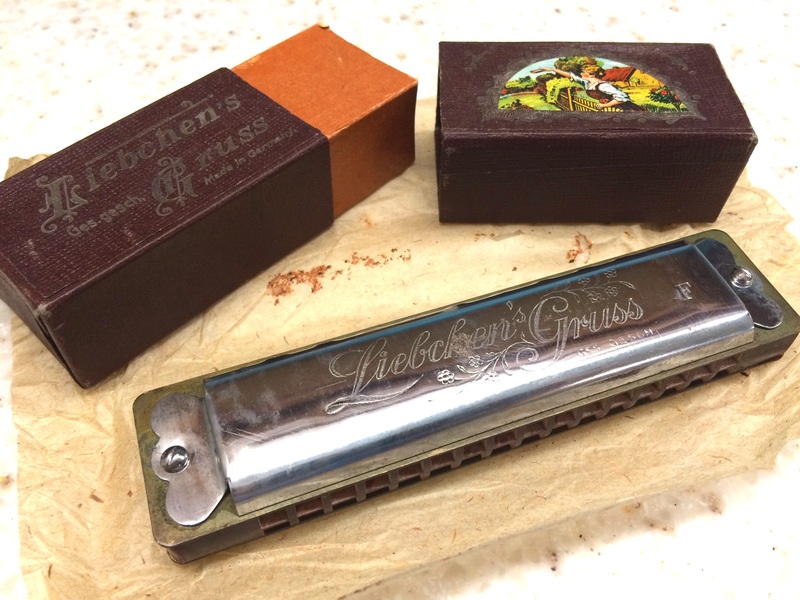 So I thought it might be cool to own an authentic German harmonica from that time period. Here’s the one that I purchased. It’s not quite as old as my grandfather’s, but it’s still very cool. The case says Liebchen’s Gruss which means Sweetie’s Greeting. And it has a brightly colored sticker showing “sweetie” waving something in the air. Possibly a harmonica. The case also says Made In Germany and “Ges. gesch.” which means registered or patented. The actual harmonica is pretty basic. It’s in good shape, with just a couple spots of rust and no wear marks to be seen. 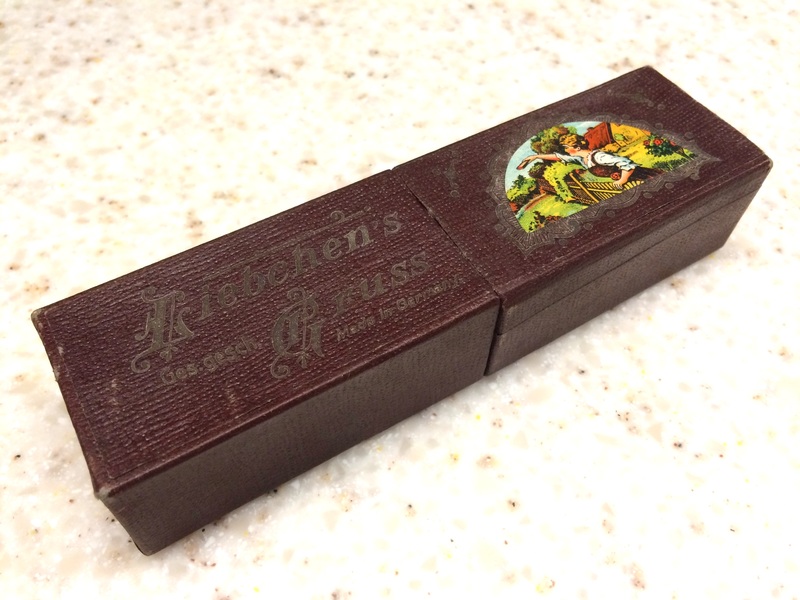 “Liebchen’s Gruss” is etched into both sides. I’m happy with my purchase and I’m glad I noticed the antique store and decided to check it out. 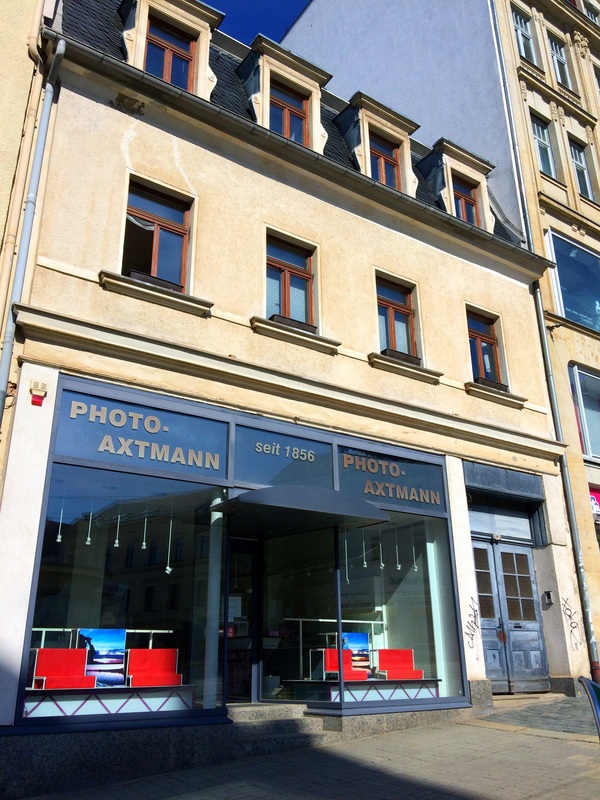 But wait, there’s even more Plauen to explore! 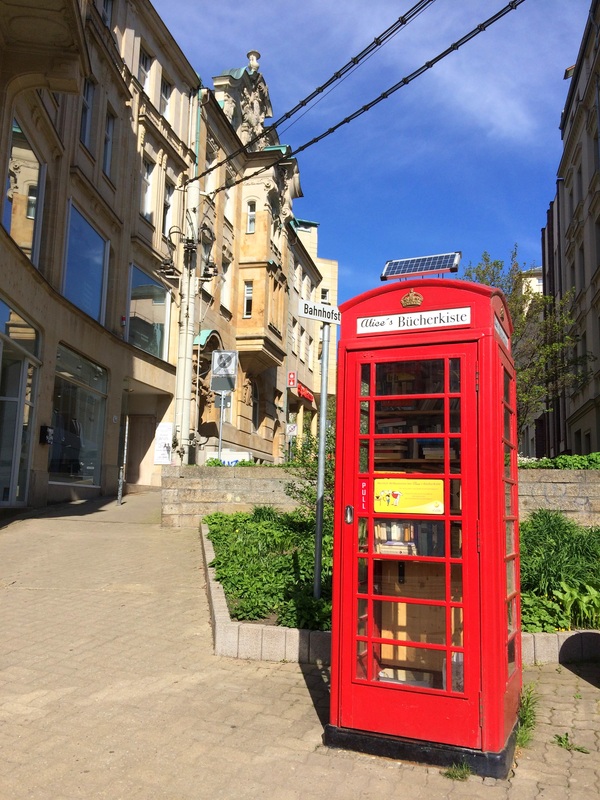 You haven’t quite seen all of Plauen yet! 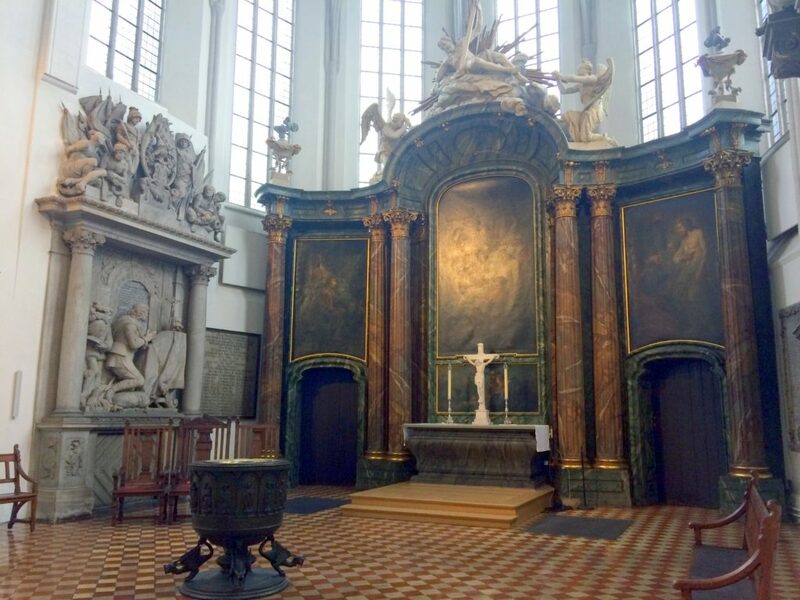 In my next post, we’ll explore some churches and we’ll also explore the neighborhood where my grandfather grew up! So stay tuned! 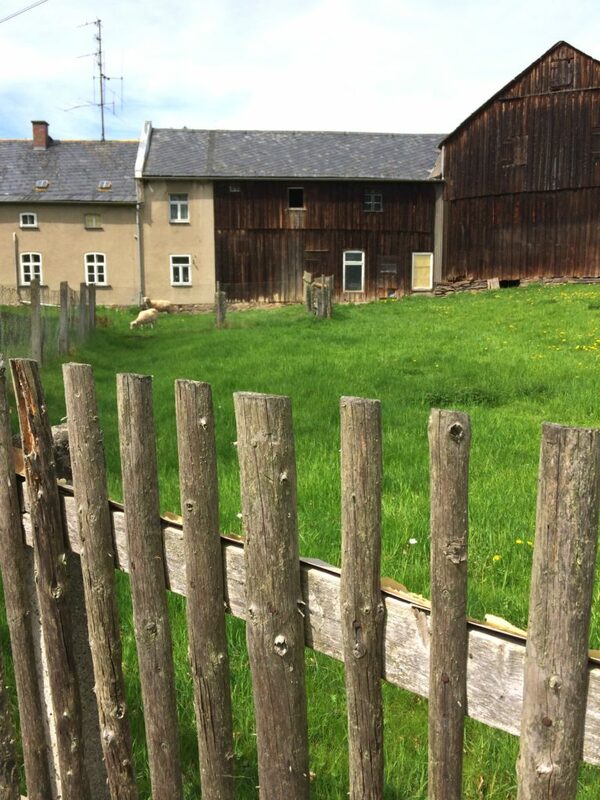 A couple weeks ago after speaking at a software developer conference in Berlin Germany, I had the opportunity to take several personal days while there and I got to see some of the countryside! It was pretty great! I rented a car and then drove south out of Berlin. 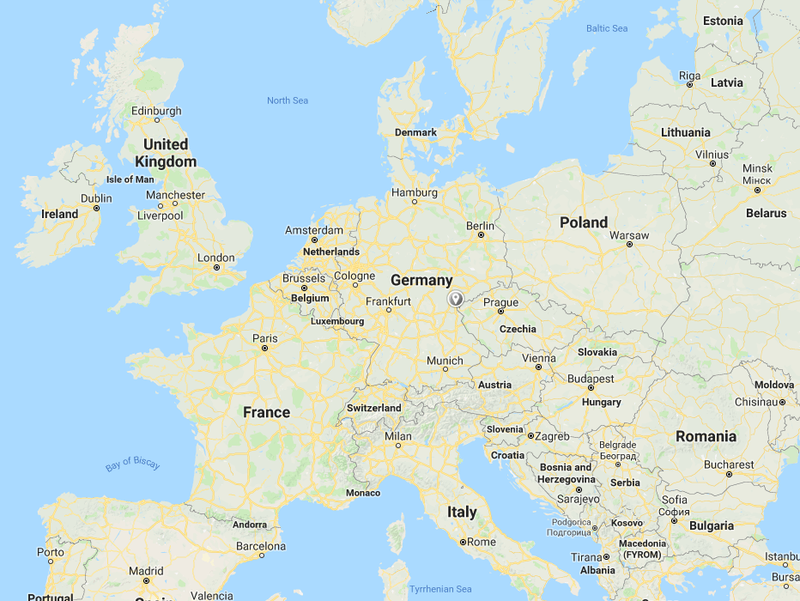 Sort of towards Munich but only about half that far. 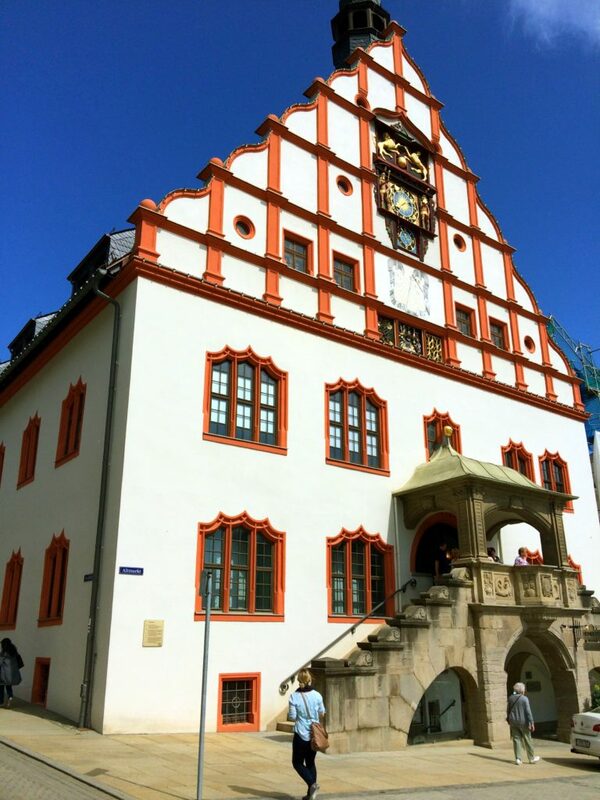 My destination was a tiny little village called Zaulsdorf that is tucked into a tiny little valley of beautiful rolling hillsides. 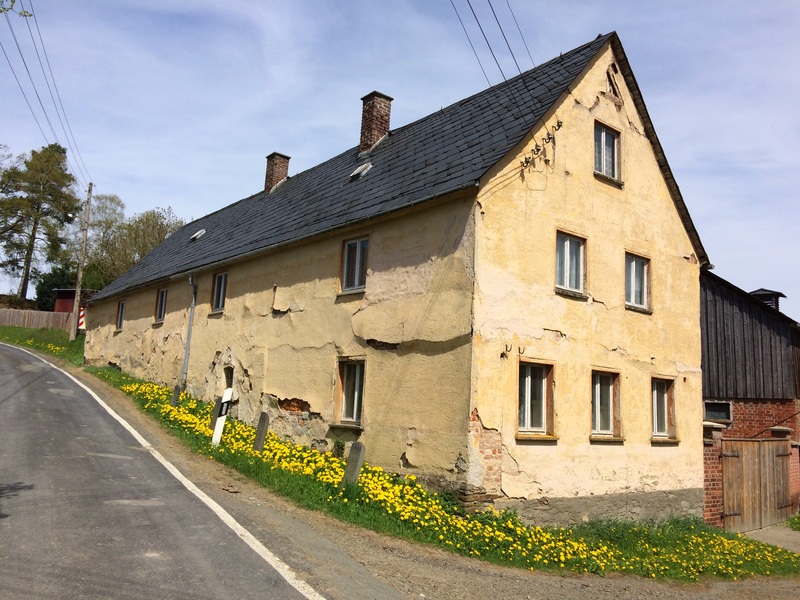 This is where my grandfather, Kurt William Leucht, was born and where he lived till about the age of 4. 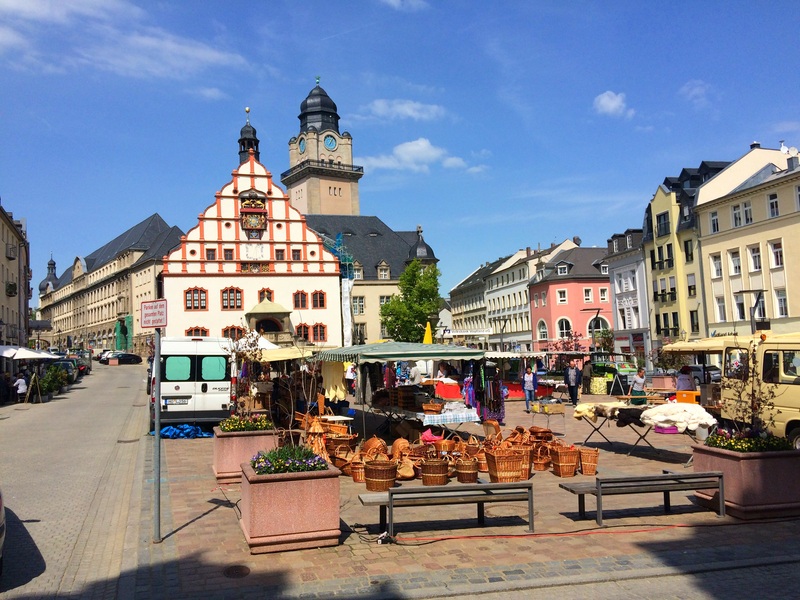 I grew up in a very rural area of Central Illinois, so seeing rural Germany was really fun for me. Here’s a photo that I took of Zaulsdorf from above. It’s a very small farming community. There are probably only 20 houses in total. 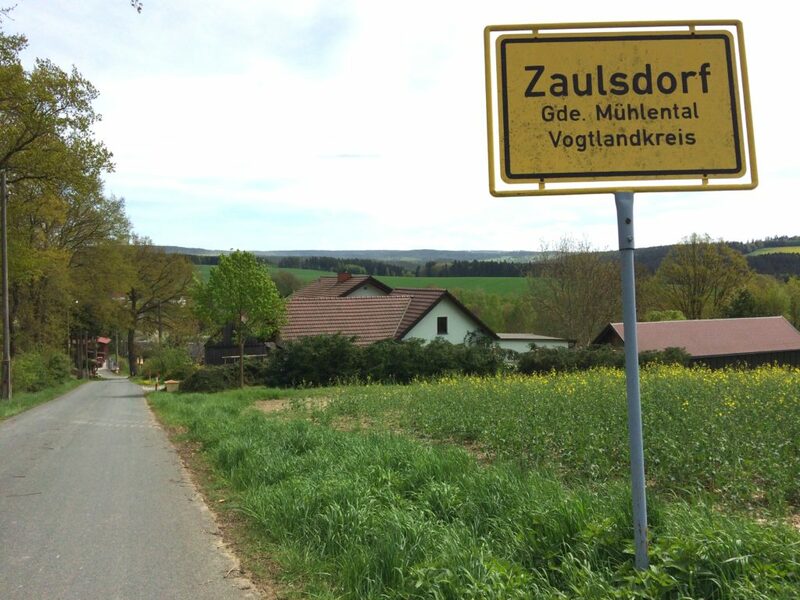 Zaulsdorf reminds me of the small unincorporated community of Allentown, Illinois that I grew up in. The beautiful yellow flowering fields seen in this photo are very common in Germany and are growing rapeseed which is the 3rd largest source of vegetable oil in the world. Zaulsdorf is just a couple miles off the nearest highway but is only accessible via a one lane road that is both steep and winding. This photo shows the large rural land plots within the village and also some of the farmland on the hills in the distance. There are only a couple of small one lane roads in Zaulsdorf. I parked my rental car along the playground near the center of the village and walked around for a bit. 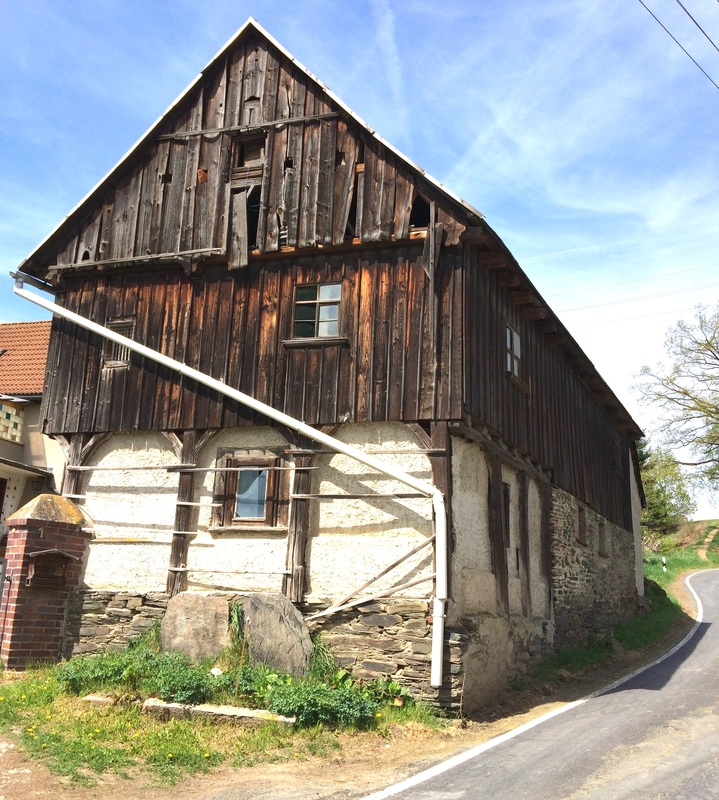 I was mainly looking for old structures and old houses that were likely in place back in 1900 when my grandfather was a pre-school child there in the village. Like this old house. This old barn was probably also there in 1900. Look at that architecture! They don’t make ’em like this anymore! It’s a real work of art! Here’s a close up view of the slate stone wall foundation. Amazing. This little stream was at the bottom of the valley, in a park or playground. 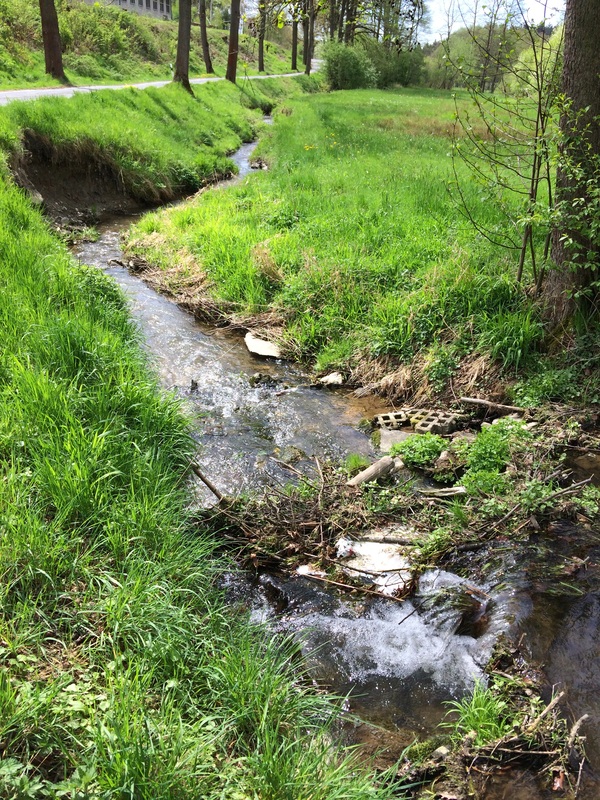 While looking at this stream it was easy to imagine my 4 year old grandfather playing in it back in 1900. At least I know I would have played in it as a 4 year old! This photo shows some of the properties and houses from the bottom of the valley looking up. Some of the houses were cute little cottages, while some were larger modern looking structures. 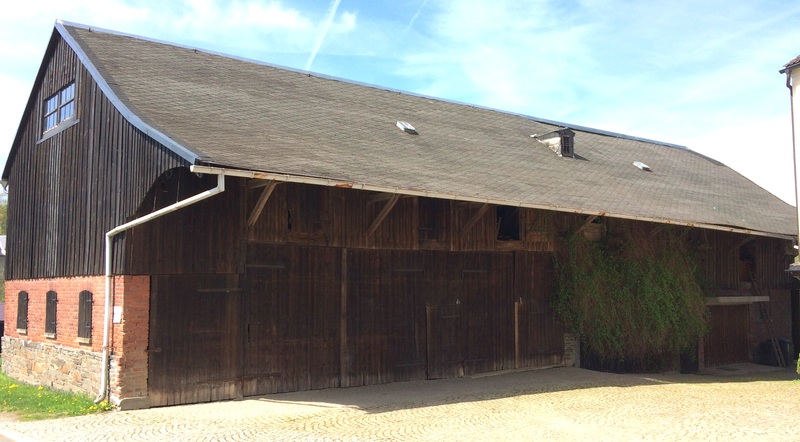 This old barn has an old slate rock roof. It’s beautiful. 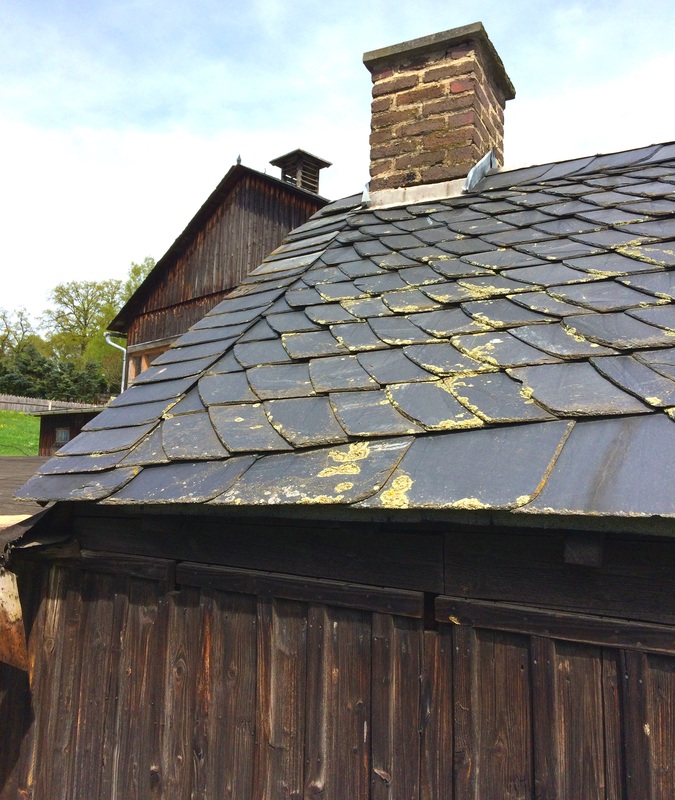 These types of roofs can last for 200 years! 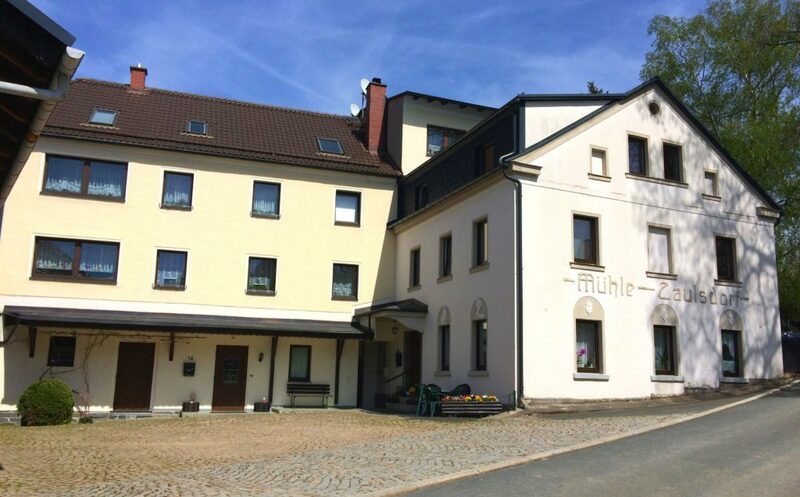 For many generations in Zaulsdorf, my grandfather’s family owned the village mill, which was a central focus of Zaulsdorf. In 1902, they sold the mill to the Halbauer family. 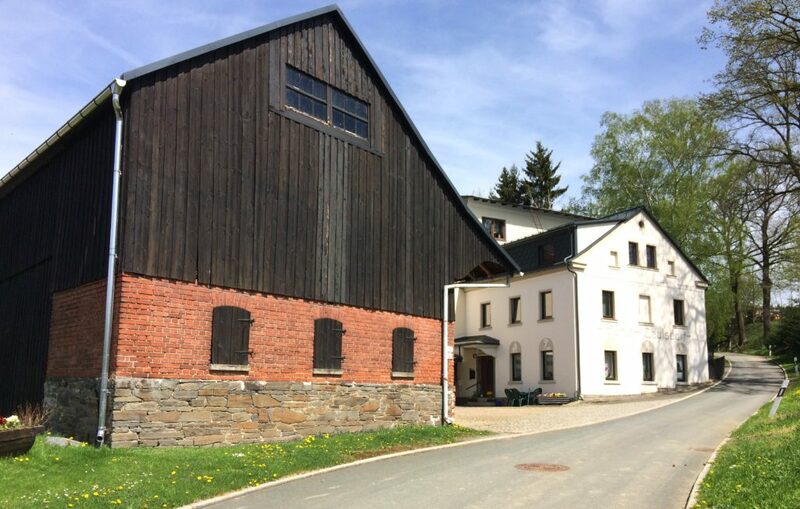 The mill was a working centerpiece of Zaulsdorf until about 1986, when it was shut down and the mill building was turned into apartments or a duplex of sorts. 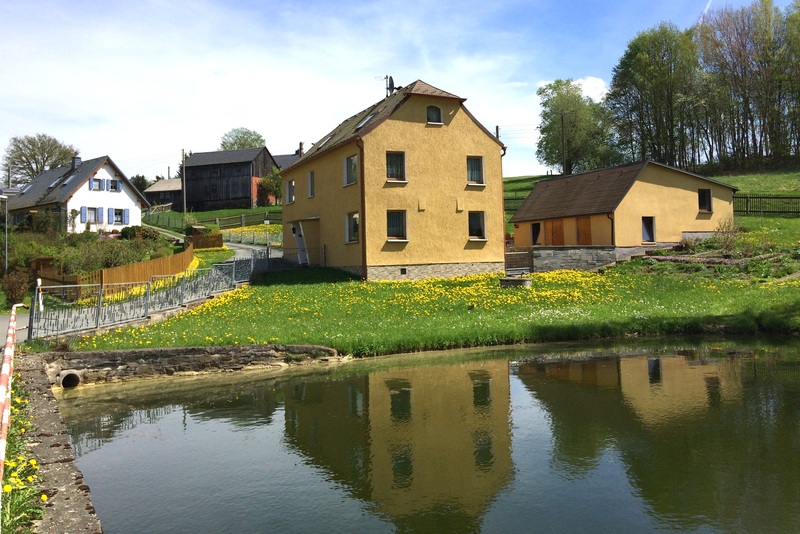 The white building in this photo is the old Zaulsdorf mill. The old Zaulsdorf mill used water from a brook or stream on top of the hill which was guided in a pipeline to the mill. 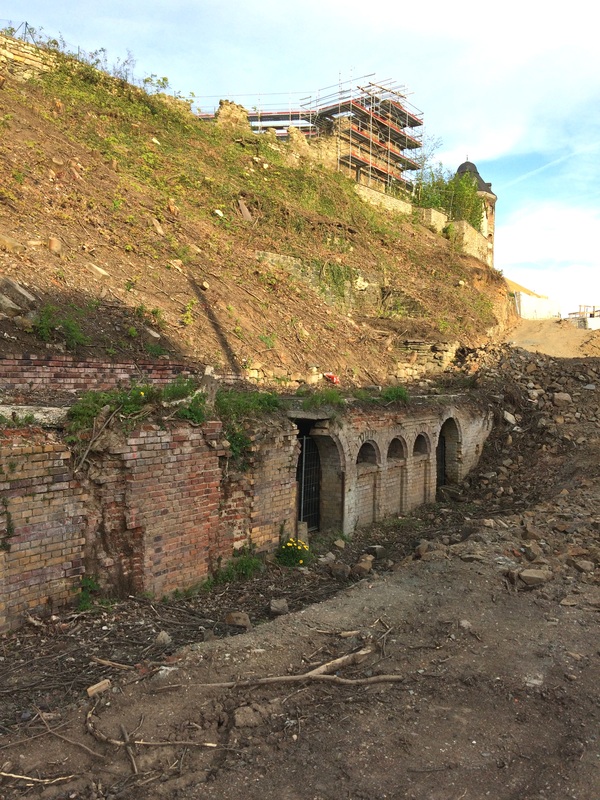 Inside the mill building, the water flowed through a turbine and then exited the building into the brook again. So the entire mill drive ran inside the building and wasn’t visible from the outside at all. Inside the mill, people ground grain into flour. There used to be a lot of mills like this in Germany because the farmers had only small pieces of land and couldn’t easily transport their grain across long distances. But they are becoming more and more rare. Here is a closer photo of the mill. It was mid-morning on a weekday when I was there exploring the village. Part of me wanted to walk up and knock on all the doors and ask if I could explore inside the old mill building. But I don’t speak German at all. And it looked like nobody was home anyways. So I chickened out. 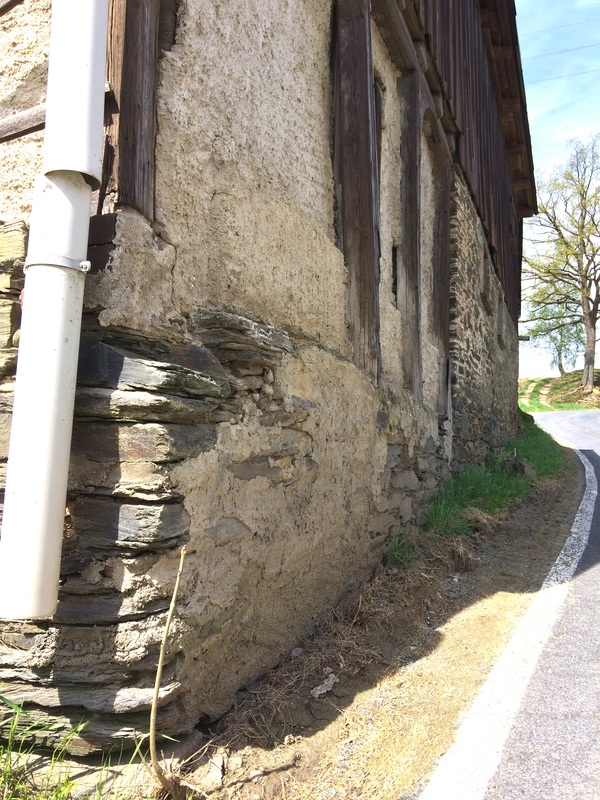 This large old barn next to the mill building looks like a fun place for a 4 year old to play in 1900. I think it would be cool to explore inside today, just to see what my grandfather experienced back in 1900. But it didn’t seem like anyone was around. So I just imagined what it’s like inside. What are the odds that there is something of my grandfather’s actually up in the attic of this old mill barn right now? Like an old toy or an old book? With his name scratched on it or written in it? Wouldn’t that be cool to find! 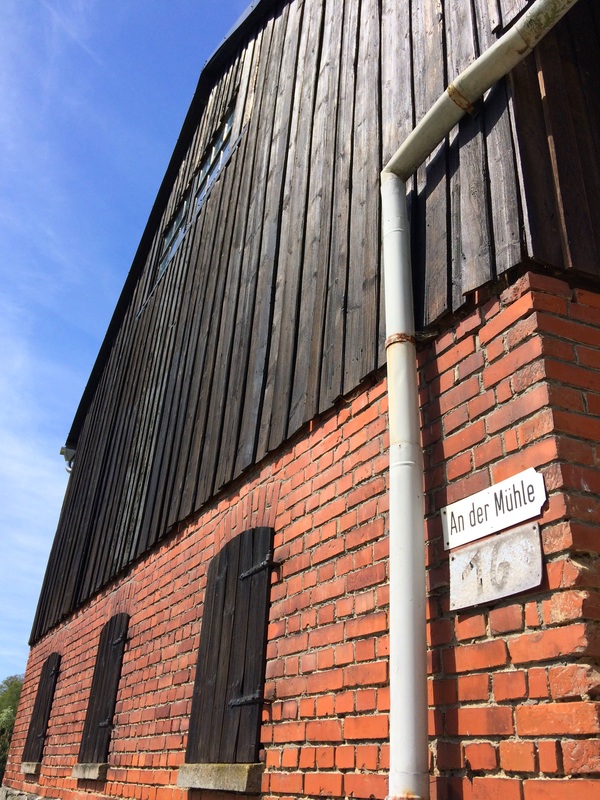 Here is a close up of the old barn next to the mill building. The sign says “at the mill”. I’m assuming this barn was part of the mill property based on its location and also based on that sign. I almost missed it, but in the small park or playground in the middle of the village was this memorial from World War I. It’s about chest high and it’s towards the back of the property. 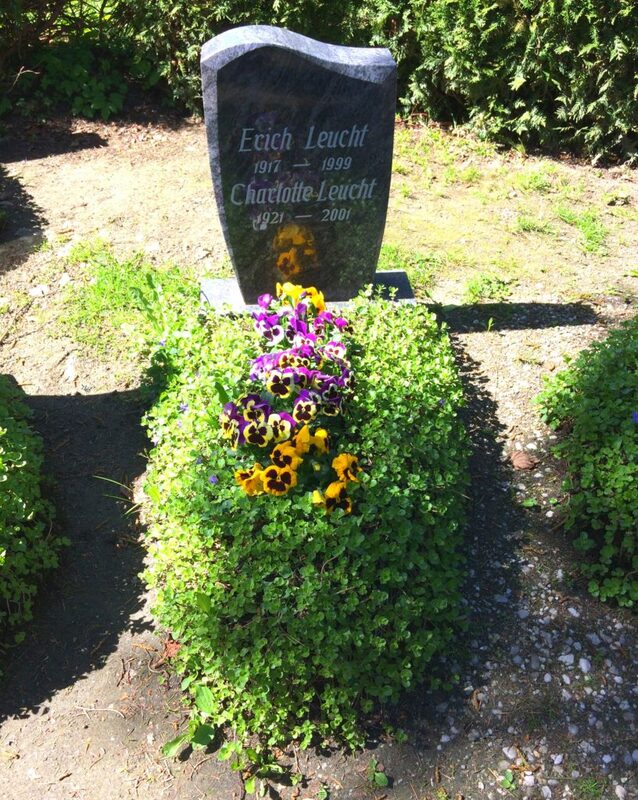 So who are these two Leucht guys who were from Zaulsdorf and died in WWI? I’m not sure. 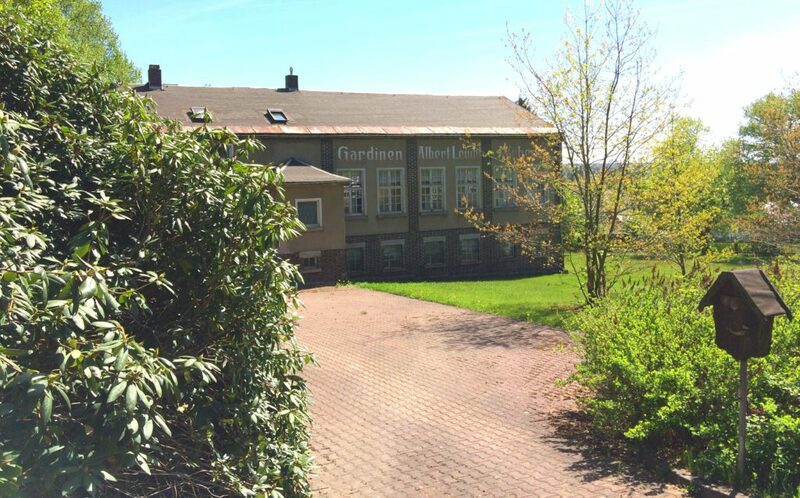 My immediate relatives moved out of Zaulsdorf in 1900, but maybe there were other Leucht families living there. Leucht was a fairly common name in the area. 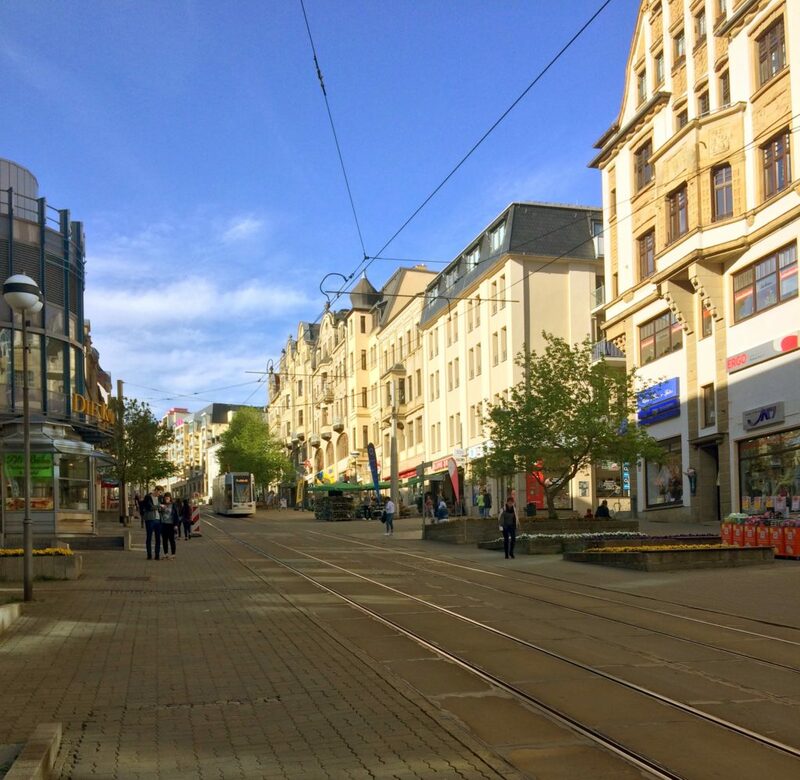 I popped into Leipzig quickly, which was about midway on my trip to Zaulsdorf. 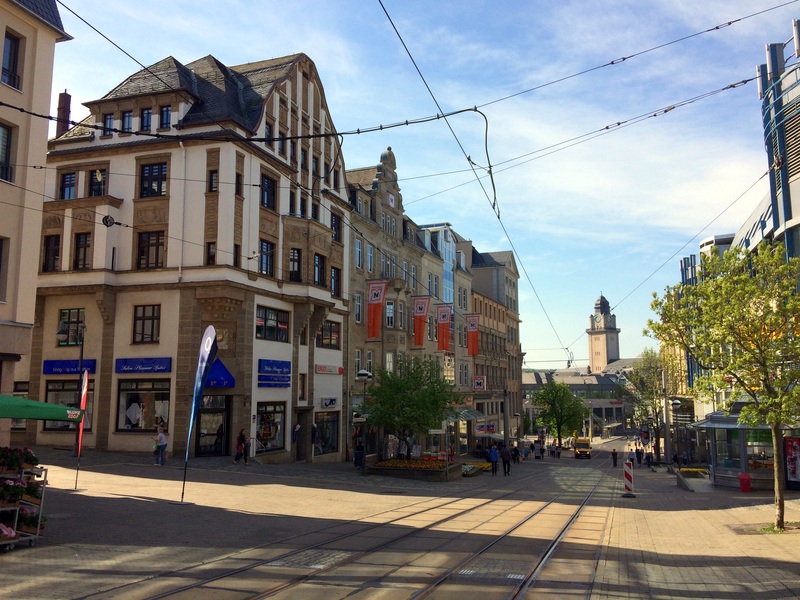 The reason I wanted to get a look at Leipzig was that my grandfather stopped there when he was 18 years old and travelling to the northern coast of Germany for his overseas trip to America. 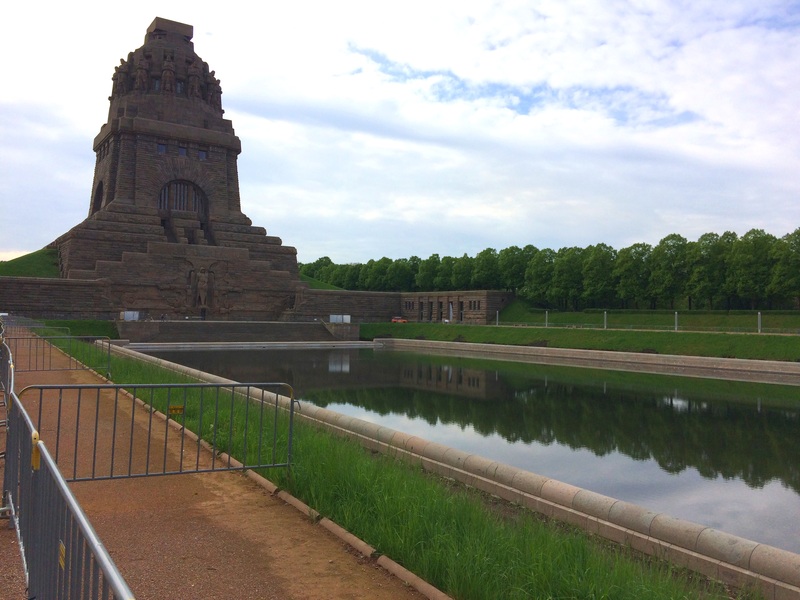 He wrote in his journal that he had a couple hour train layover in Leipzig and that he saw the Battle of the Nations Monument. First I explored this big cemetery that was right next to the Battle of the Nations Monument. It was pretty cool. This photo is still inside the cemetery, but you can see the massive Battle of the Nations Monument in the background. This huge monument was built in 1913 and my grandfather saw it in 1914. If you look closely you can see two people at the base of the monument, which gives you a better feel for the size of this thing. It’s really big! Photos don’t quite do it justice. This monument is immense. It’s 300 feet tall! The monument commemorates Napoleon’s defeat at Leipzig. It is claimed to stand on the spot of some of the bloodiest fighting, from where Napoleon ordered the retreat of his army. 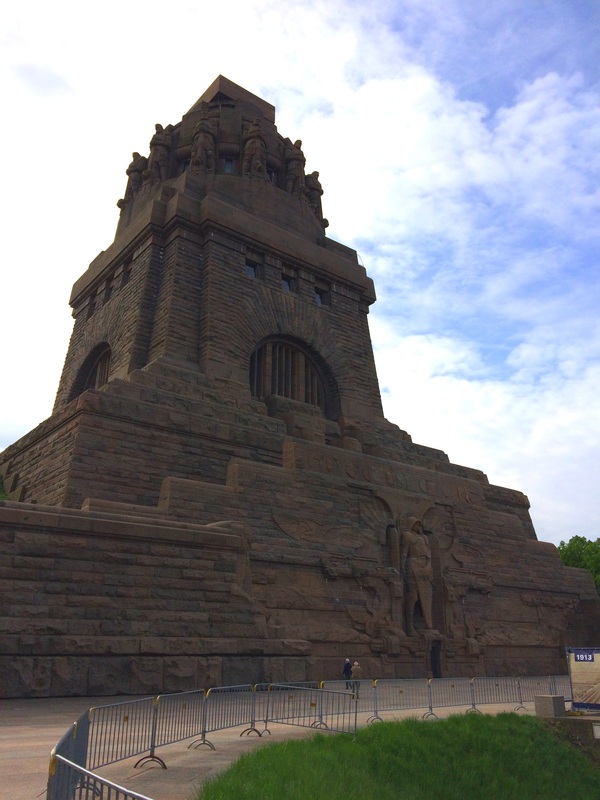 I didn’t have a lot of time in Leipzig, so I didn’t actually tour the monument or the museum or anything. I just walked around it, took some photos, was amazed, and then got back on the road. This is just some random stuff related to my travels through the countryside. Here is the rental car that I got in Germany. 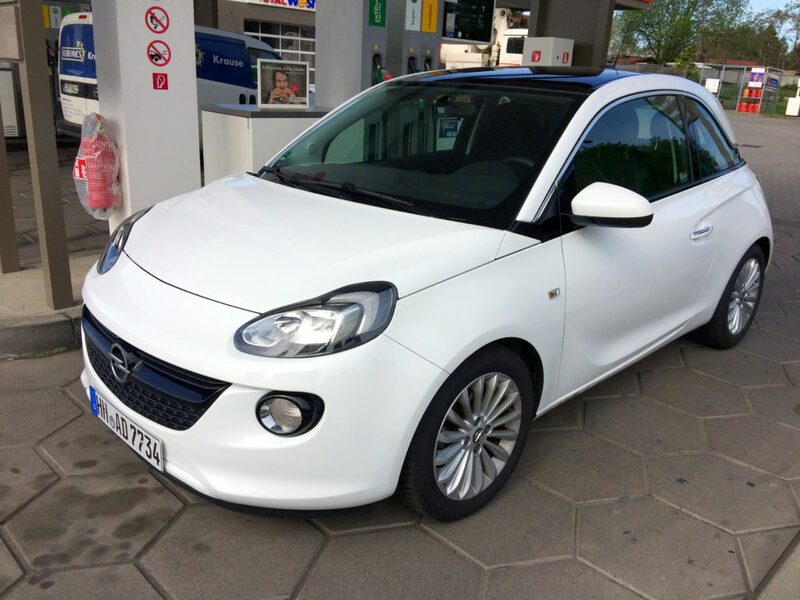 It’s an Opel Adam. It’s just a bit bigger than a Mini Cooper. And more streamlined. I liked it. It had all the bells and whistles. And it ran great. I ran at 105 mph (170 km/h) on the Autobahn for a while and this car didn’t even blink. By the way, at that speed people were still zooming past me like I was standing still! This car had a 5 speed manual transmission. Now that I think about it, they didn’t even ask me if I could drive a manual transmission. They just gave it to me. Obviously, I can drive a manual. I actually prefer a manual transmission. Every car I’ve ever owned has been a manual. The vast majority of all vehicles in Europe are manual and in some countries you even have to prove that you can drive a manual before they will even give you a licence. 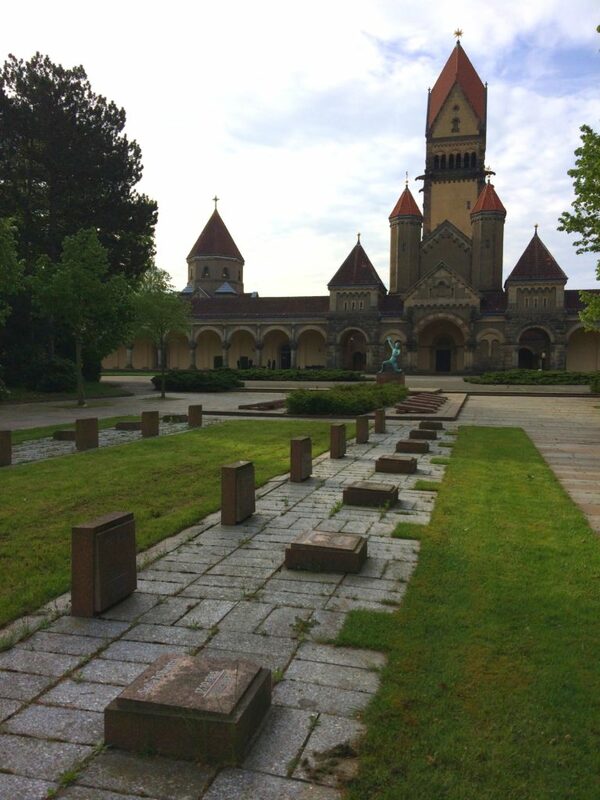 On my way out of Zaulsdorf, I thought it might be interesting to visit a couple of local country cemeteries. Here is one of them. It was very small, less than one city block. 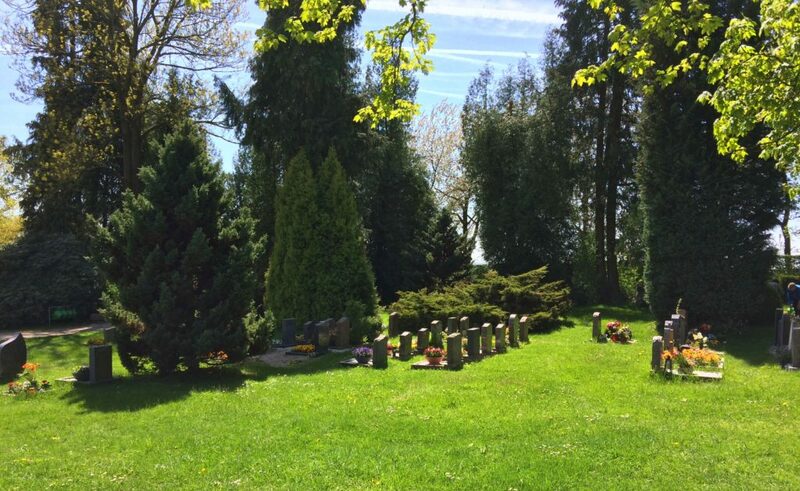 I wondered if any of my ancient relatives were buried in any of these small town cemeteries in this area. 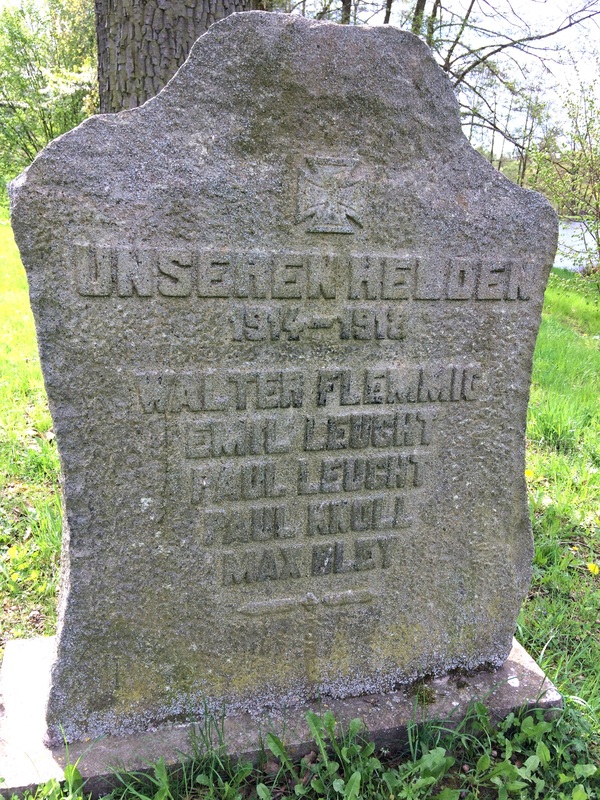 I did find a Leucht couple buried at one of the cemeteries that I visited. But I don’t think they are from my family. At least not a part of the family tree that we have found and documented. I stumbled across this planetary statue thingy while searching out a public restroom in a small village near one of the local country cemeteries. 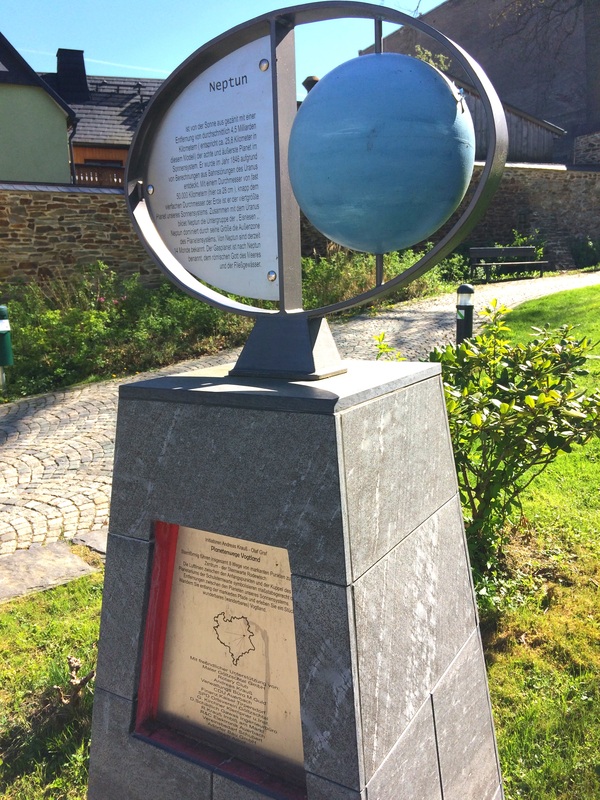 Turns out there are 8 of these planet displays installed around Vogtland, which is basically the name of the county here. Each display shows one of the planets in the solar system And the distances between the displays is scaled to the distances between the planets. That’s kinda cool. A person would need to travel all over the county in order to see them all. And they would get a feel for the relative distances between the planets. Neptune is the eighth and outermost planet in the solar system, with an average distance of 4.5 billion kilometers (equivalent to about 25.8 kilometers in this model). It was discovered in 1846 on the basis of Uranus orbit interferences. With a diameter of almost 50,000 kilometers (here about 28 cm), just four times the diameter of the earth, it is the fourth largest planet in our solar system. Together with Uranus, Neptune forms the subgroup of the “ice giants”. Neptune dominates by its size the outer zone of the planetary system. Neptune currently has 14 known moons. The gas planet is named after Neptune, the Roman god of the sea and the flowing waters. 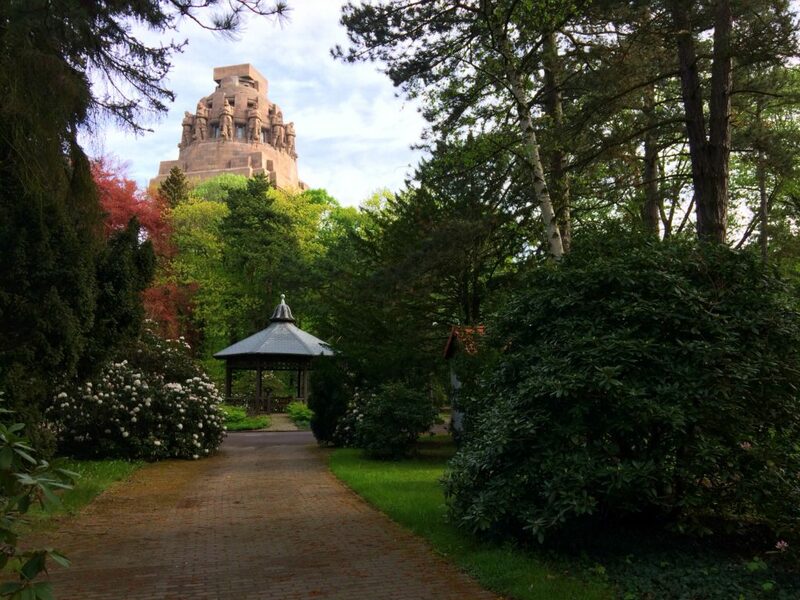 A total of 8 paths lead from landmark points to the center – the observatory Rodewisch. The lines between the starting points and the dome of the planetarium of the school observatory symbolize the distances between the planets of our solar system. 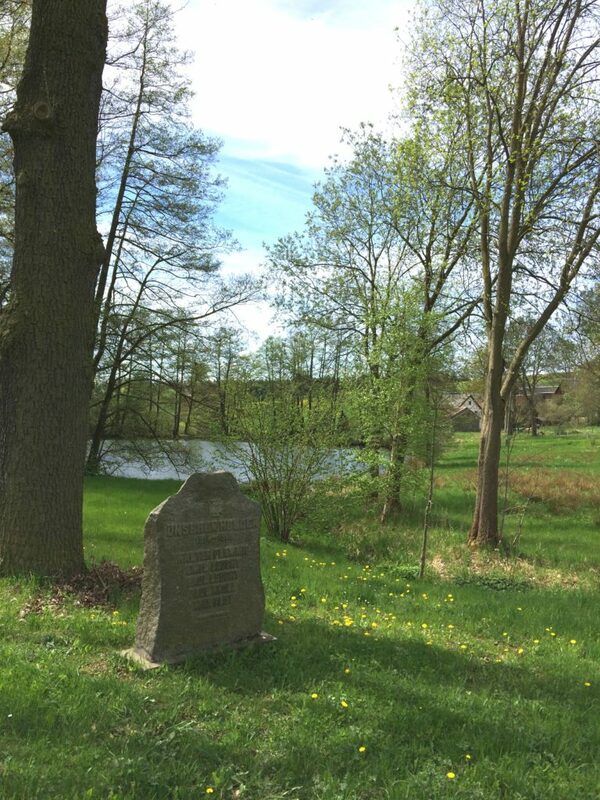 Walk along the marked paths and experience a piece of wonderful (hiking) Vogtland. Very cool. I like that. I wonder how many public schools shuttle their students all around the county to see all of these displays. That’s a pretty cool learning experience. Although it might make for a long day. But wait, there’s more Germany to explore! 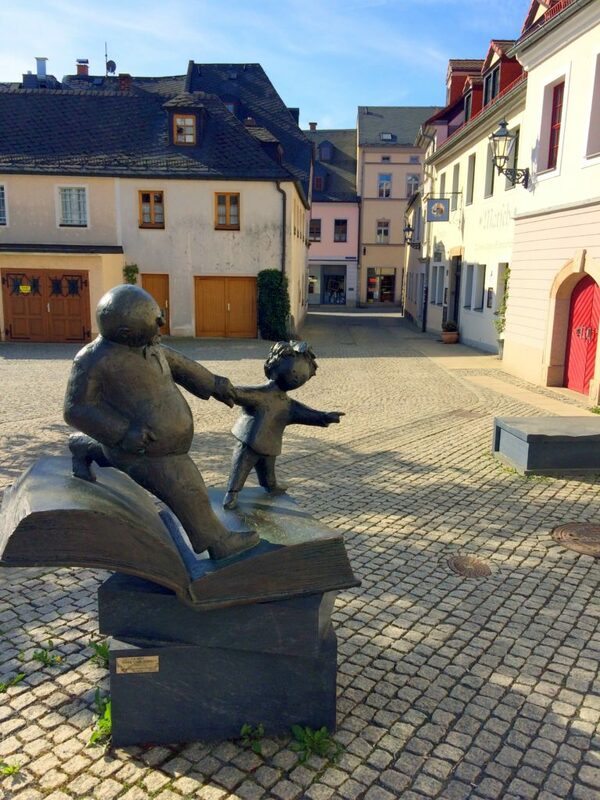 My next stop was Plauen, where my grandfather lived from age 4 to age 18, when he came to America! Next time I’ll publish some details and photos from that part of my trip! A couple weeks ago after speaking at a software developer conference in Berlin Germany, I had the opportunity to take several personal days while there and I got to see quite a bit of the city! It was pretty amazing! 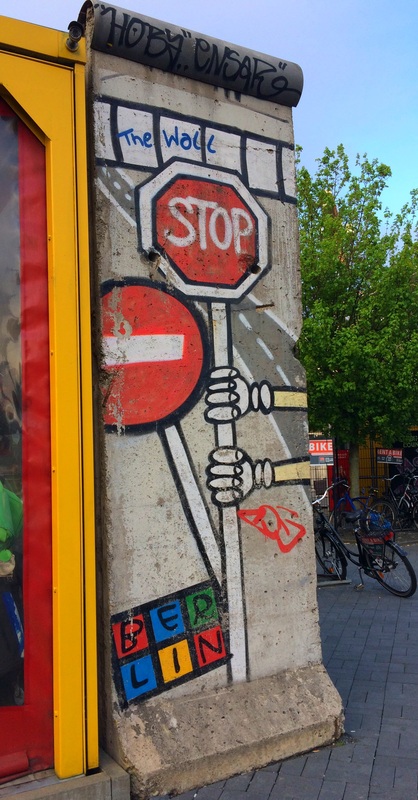 There was so much to see and do in the city of Berlin, that I can’t even fit it all into two separate blog posts! 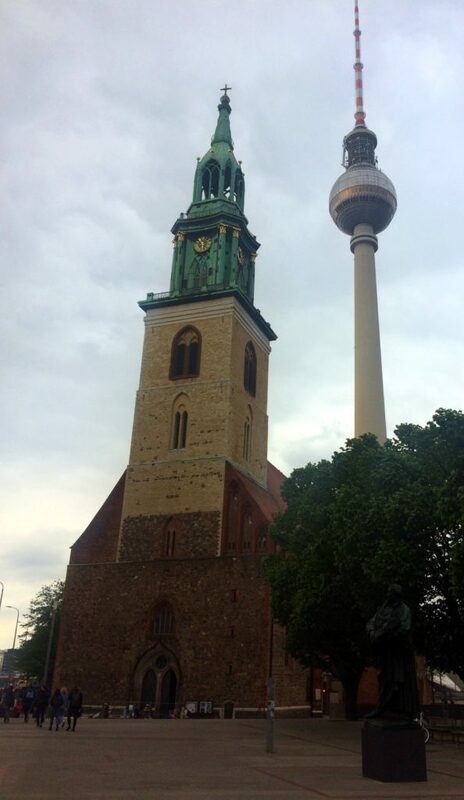 So welcome to part 3 of Berlin sights! 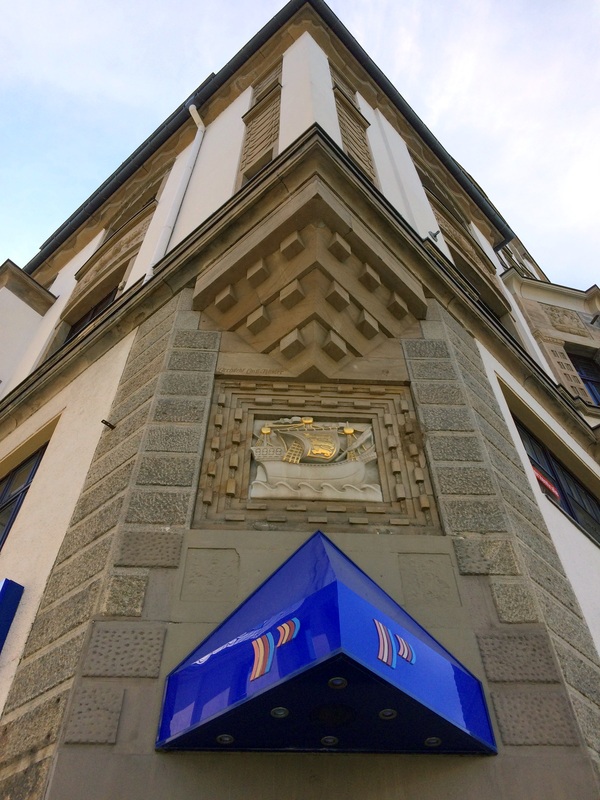 I only happened upon this small unassuming museum because I walked right past it on my way to the conference! It’s a great little museum, though! 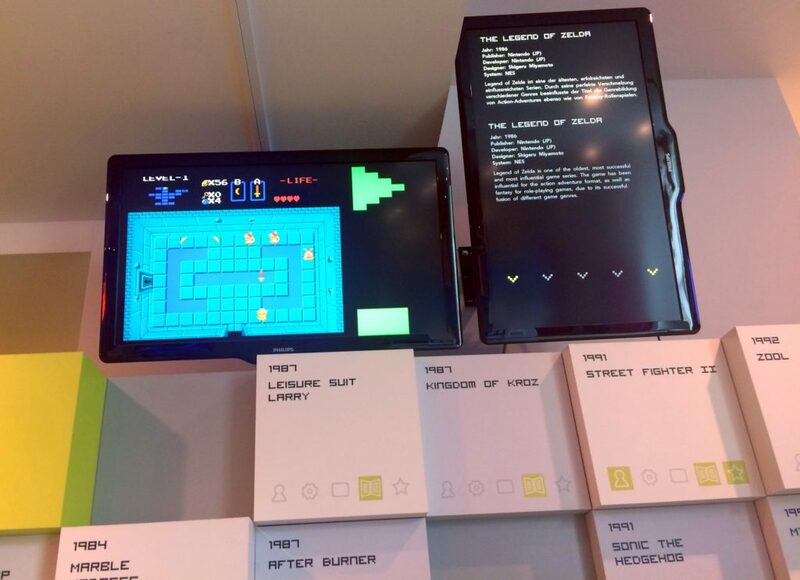 The Computerspiele Museum covers computer gaming, console gaming, and handheld gaming. 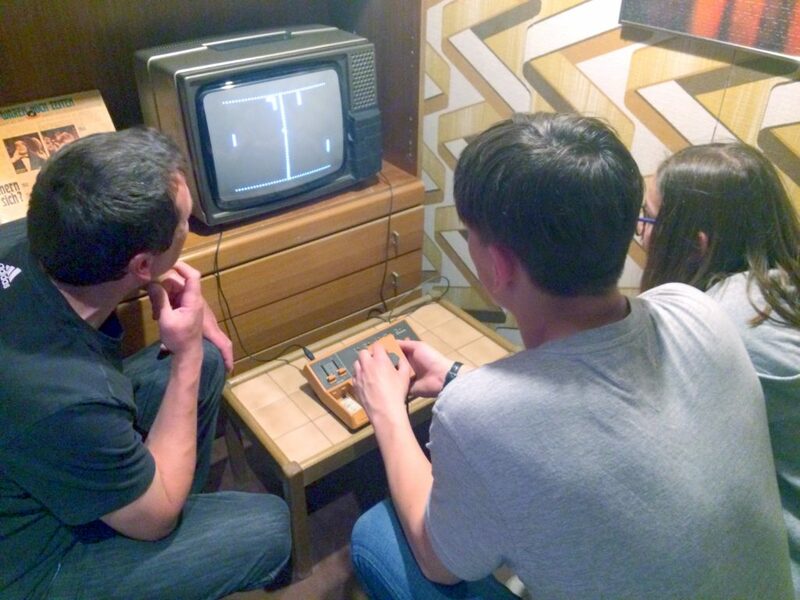 It has some great exhibits and displays and it also has lots of retro games that you can actually play! This was the display for a cool home console system that I had never seen before. It’s a Magnavox Odyssey console from 1972. I was 2 at the time, so it’s no surprise that I don’t remember this console. It was black and white and it didn’t have any sound. It did not use memory storage game cartridges. Users actually swapped out various circuitry cards in order to change the play mode of the system. It included a very rudimentary set of controllers that had a couple of dials that the users turned to move simple white targets around on the TV screen. And the really unique thing about this system is that it came with a set of transparencies or overlays that users were supposed to attach to the front of their TV screen using static cling! Amazing! 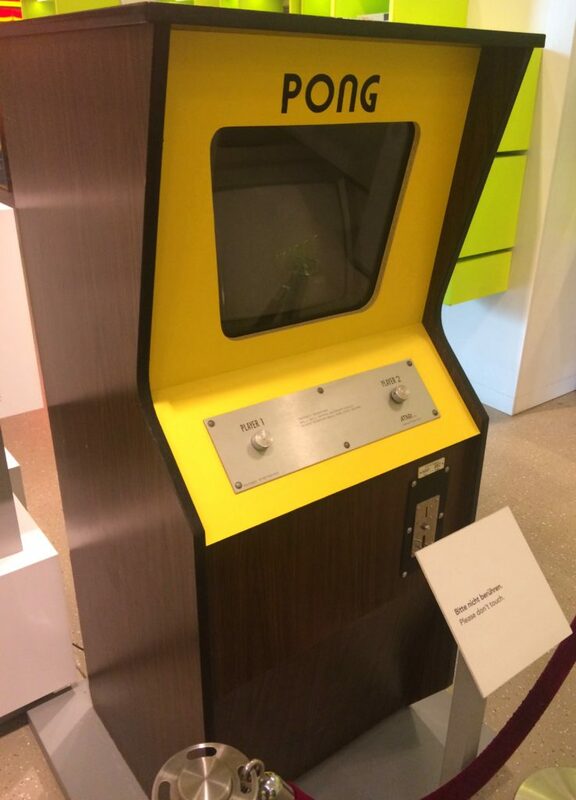 Here is one of the original Pong arcade game upright cabinets from 1972! Look how simple it was! Just a single knob for each player! Awesome! Pong was originally intended to be a warm-up exercise for a new employee at Atari. The prototype was so impressive, that his bosses decided to mass produce and market it! And the rest is history! The success of the arcade version of Pong, led many companies to create their own rip-off versions or remakes. Including the one pictured below. 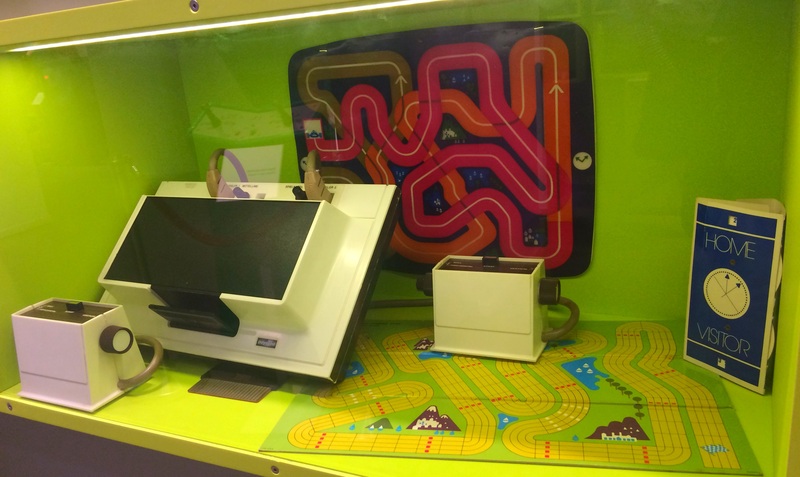 The Computer Game Museum has a number of small retro rooms set up to look like they were ripped right out of your past. And these retro rooms include working consoles like the Pong ripoff console shown in the above photo. My apologies to the young gamers who were enjoying the game when I snapped this photo. 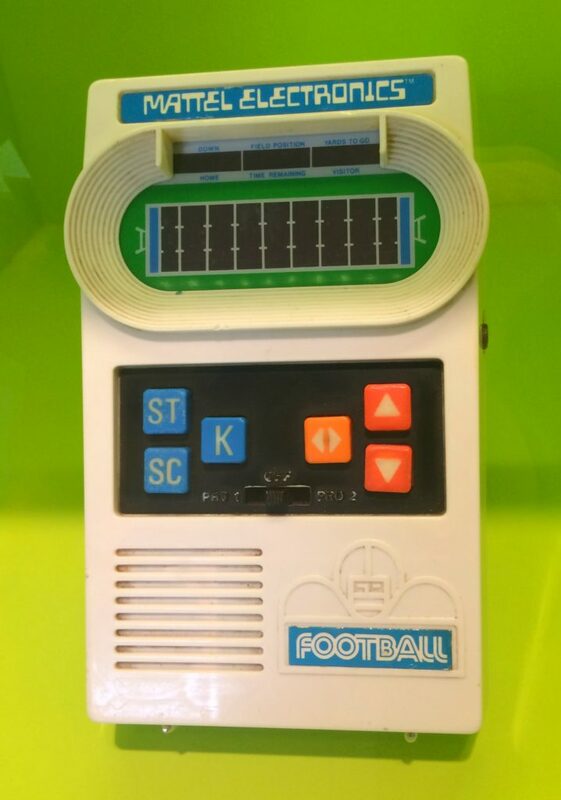 Here is Mattel’s Football handheld game on display in the museum. It was super popular in 1977 and I remember it well. This thing was literally hours worth of entertainment! And it was so simple to play! 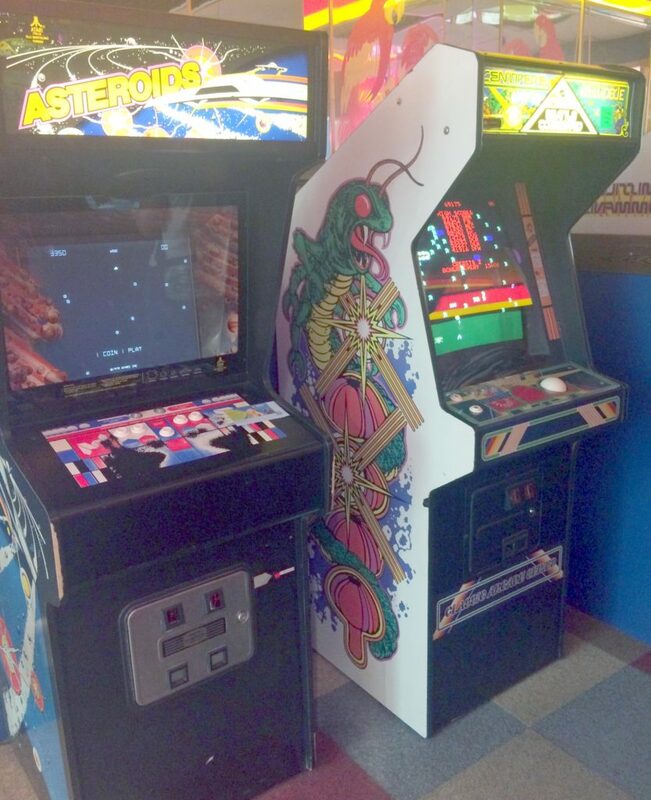 Speaking of working retro games that you can actually play, here are just a couple of the working arcade cabinets in the museum. No quarters necessary! I played them all while I was there! These particular cabinets are probably from the early 1980s. Some of the internal components have been upgraded out of necessity, but you really can’t tell from the outside. Now this is super cool. 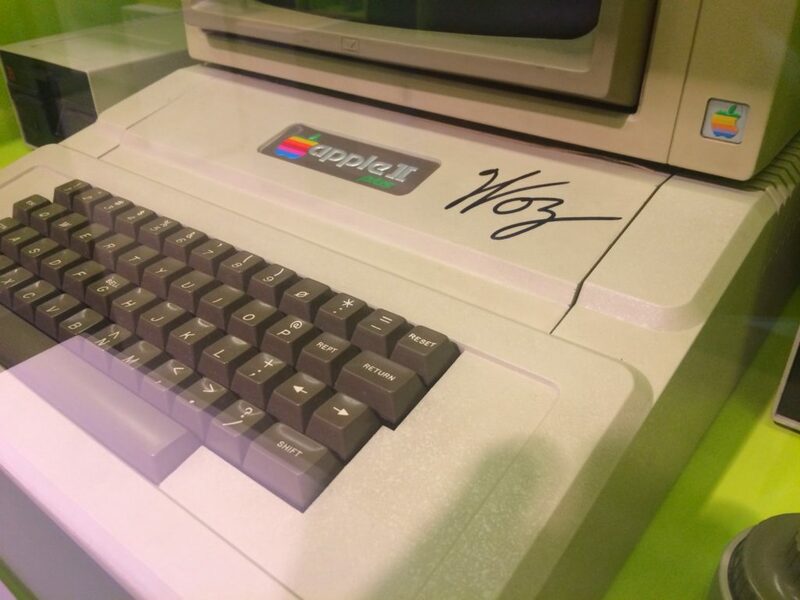 On display in the museum is this early 80s Apple II+ that is actually signed by Steve Wozniak (Woz)! This particular Apple computer model was made from 1979 to 1982 and they really got Apple moving as the premier computer manufacturer of that time. I was and still am the proud owner of an Apple IIe, which came out in 1983 and enjoyed a glorious 10 year run! The Pac-Man video game was released in 1980 and was a smash hit! It’s been released on so many platforms, it’s ridiculous! 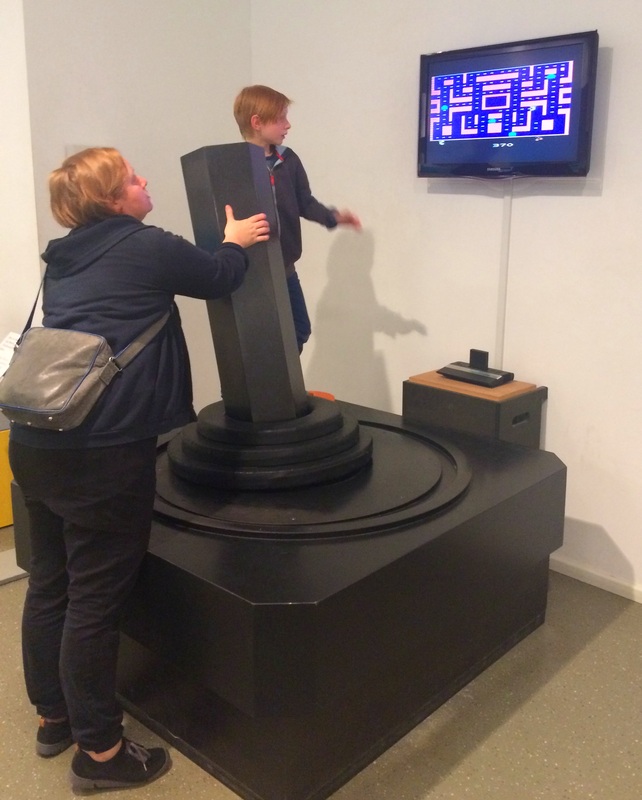 The Computer Game Museum in Berlin has one that you can play using this huge Atari 2600 looking joystick! That’s cool! It looks like it’s playing on a working Atari 2600 Jr console! 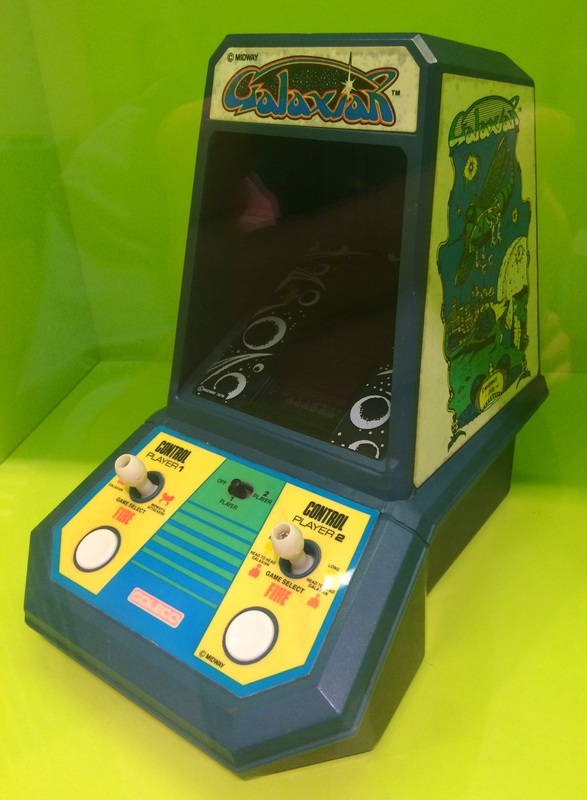 This display is pretty cool to me, because I actually owned this Coleco Galaxian tabletop mini arcade game. I played the heck out of this thing and I can totally hear the little tune it played right before the little aliens started careening down on top of you! It was worth hours and hours of entertainment for a single player or while playing with a friend! 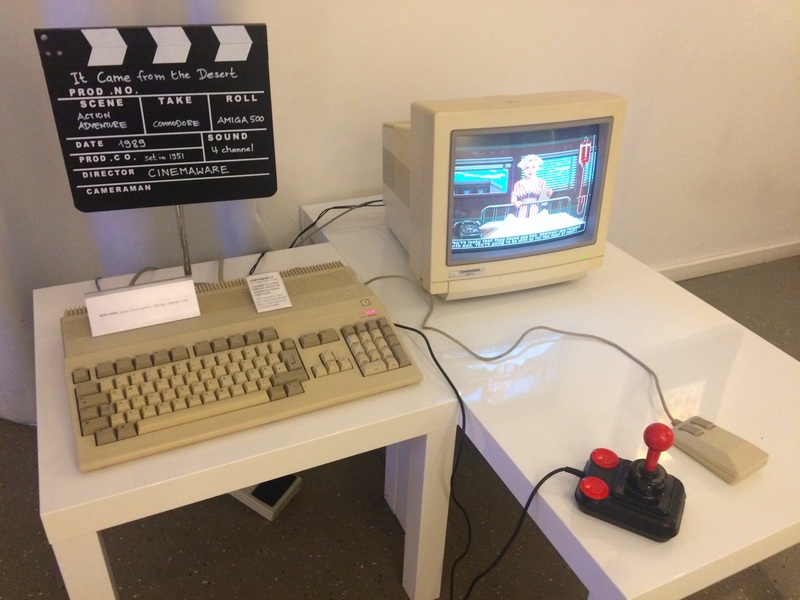 Here is another example of a retro working game console that you could just walk up to and start playing in the Computer Game Museum in Berlin. 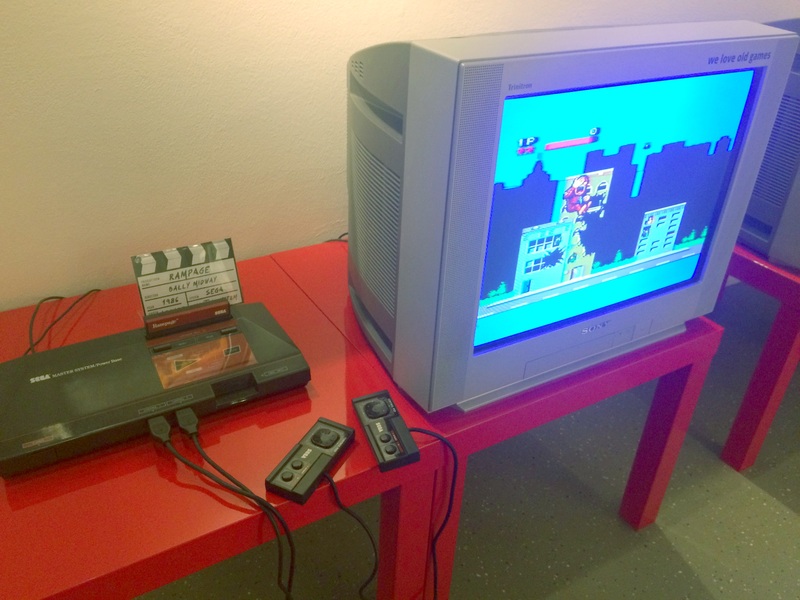 It’s the Rampage game from 1986 running on a Sega Master System console. This is especially relevant since the Rampage movie, based on the video game, was released just a week before I went to Berlin! Here is another example from 1989 that you can actually sit down and play. It’s a game called It Came From The Desert running on a Commodore Amiga 500 PC. Okay this next display was really really cool! It was an entire wall full of maybe 16 inch by 16 inch blocks stacked up. 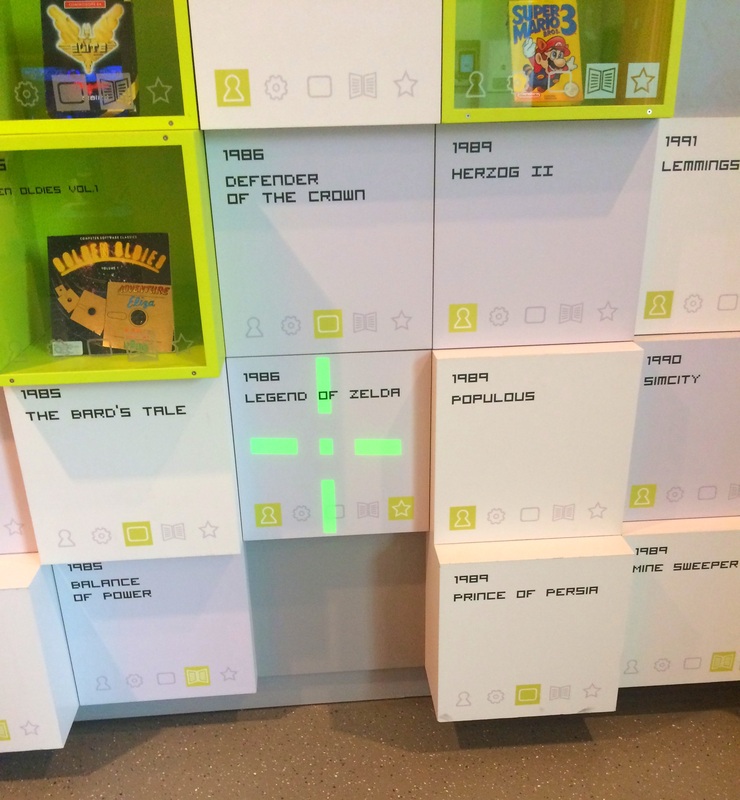 The blocks were ordered by year and each block showed a noteworthy game from the history of video games. A laser light projected cross-hairs onto one of the blocks and there was a single joystick in front of the wall. If you moved the joystick, it moved the laser projected cross-hairs to the adjacent block. Whichever block was lit up by the cross-hairs immediately gave you a show, of sorts, up on the large monitors at the top of the wall. The show for each video game included several video snippets from the game-play, often including the splash screen, on the left monitor. The show also included details about the game (including publisher, designers, etc.) displayed on the right monitor. I spent probably close to an hour watching the game-play from every single game on this wall. Including several games that I played as a kid, that brought back so many great memories. All the nostalgia feels! 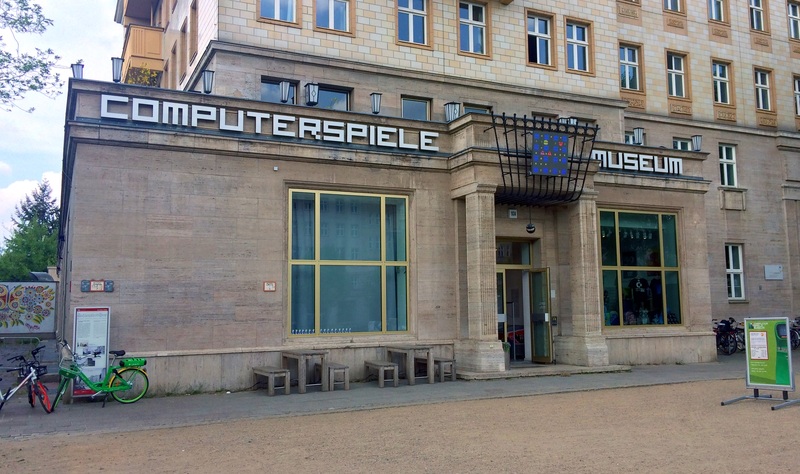 Very well done, Computer Game Museum of Berlin! There was a lot more to see and learn in this museum, but I don’t want to overdo it here on my blog. I will leave readers with one last photo. These larger-than-life characters were all over the museum! Cool! Okay, let’s change gears now. 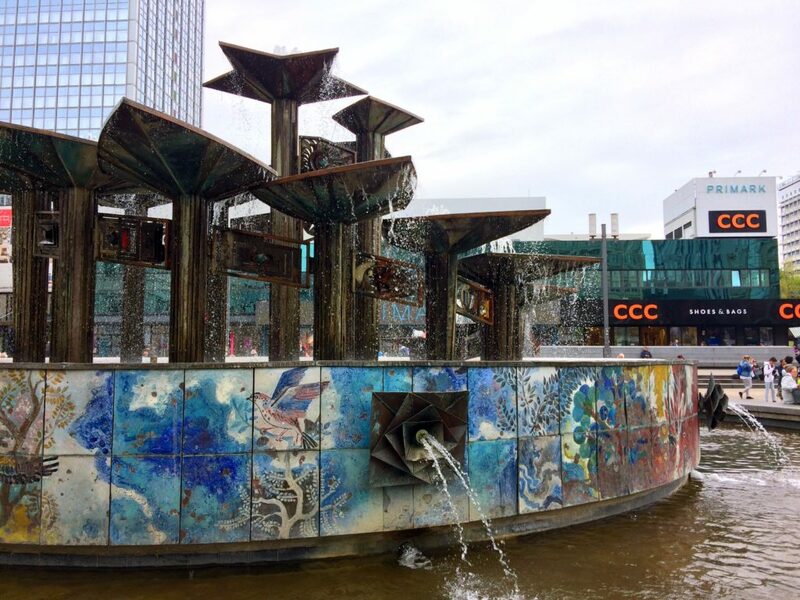 There were a couple pretty neat fountains in the center of Berlin that I want to show you. Neptunbrunnen, or Neptune Fountain was built in 1891 and features the Roman god Neptune surrounded by various animals and 4 prominent women, who represent the 4 main rivers of the country. This fountain is right next to St. Mary’s Church. It’s a pretty cool old fountain! 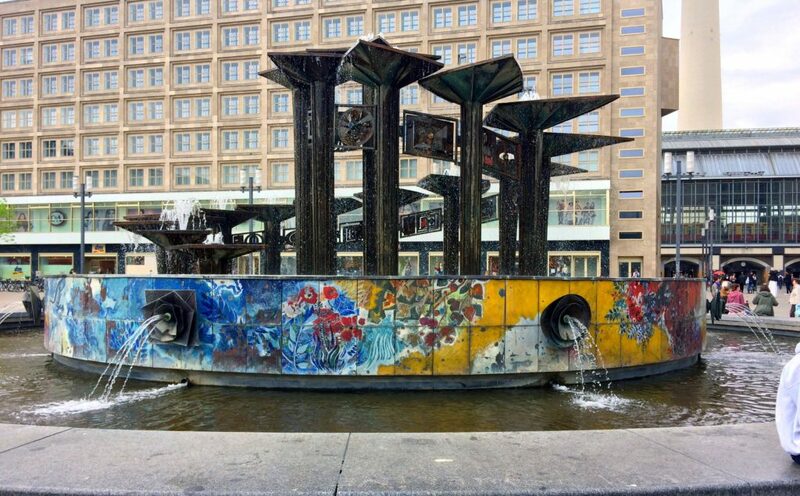 There is another, more modern and abstract, fountain just a block north of Neptunbrunnen. 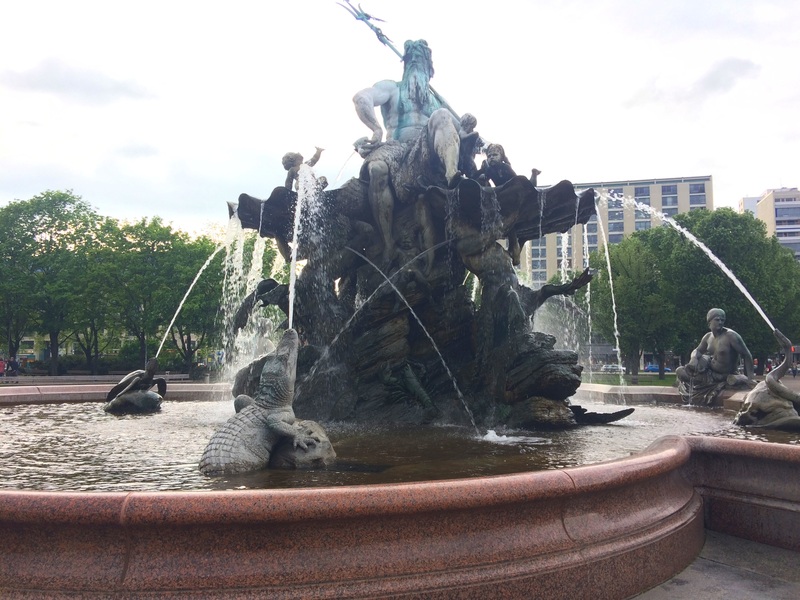 This is called Brunnen der Völkerfreundschaft, or Fountain of Friendship Between People. It’s also called the Fountain of International Friendship. I’m not a big beer drinker. Okay, I’m not any kind of beer drinker, big or small. But I noticed that you can’t throw a rock in Germany without hitting one of these Biergartens. 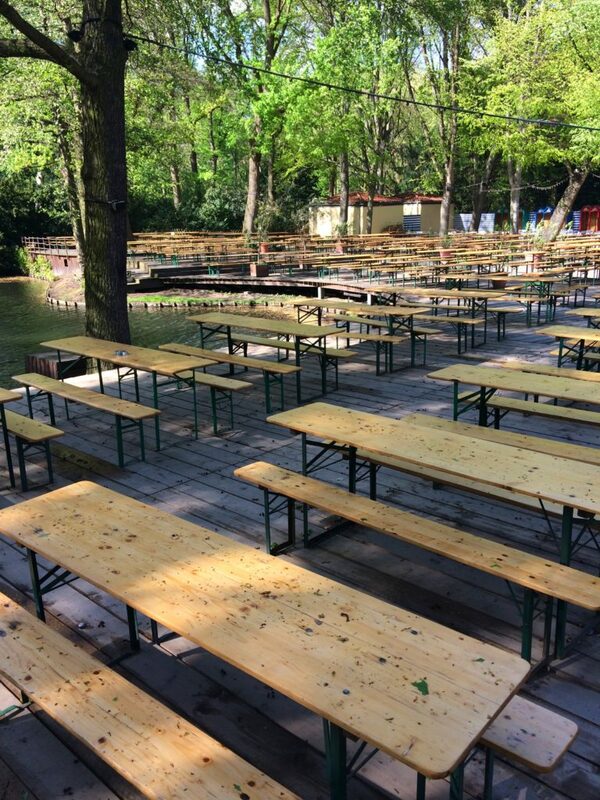 They are outdoor entertainment areas where beer and food are served, usually at large shared tables. The one pictured above is in Tiergarten Park and it’s on a cute little lake, complete with cute little boats that you can enjoy. Sadly this particular beer garden was closed when I was there. It looks like a lot of fun, though. 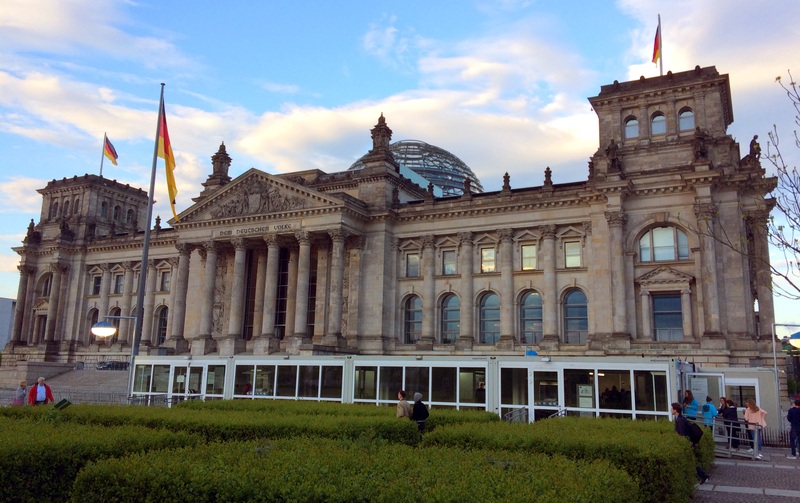 While I was in Berlin, I really wanted to check out the Parliament Building, and especially I wanted to visit the gigantic glass Dome on top of the Parliament Building! From the Dome, I hear that you can see the whole city! And you can also peer into the debating chamber of Parliament below! The Dome symbolizes that the people are above the government, which was not the case during Nazism. That’s super cool! But sadly for me, you need a reservation to visit the dome and I didn’t submit my request early enough and so there were no slots available when I tried. Missed opportunity. Here are several photos from St. Mary’s Church, which is centrally located in Berlin. It’s a fairly impressive building. It’s very cool inside too. 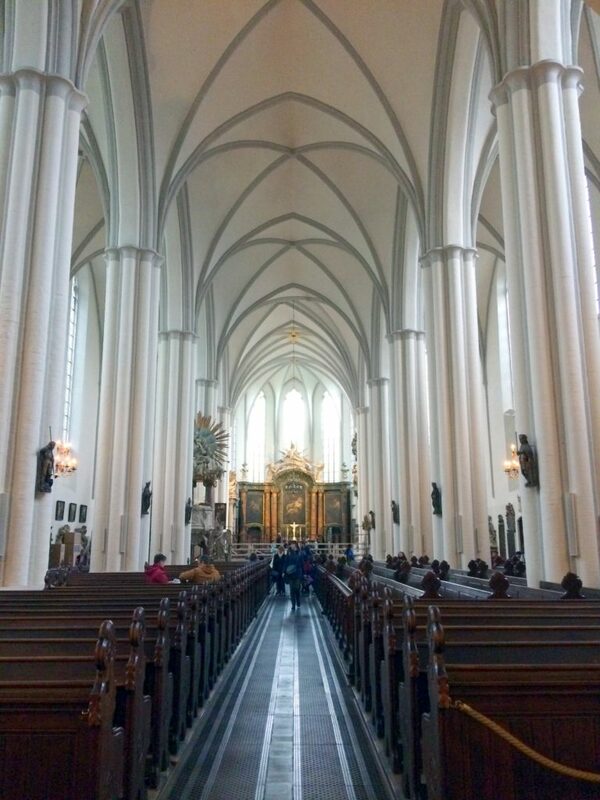 The light colors on the columns and the ceiling keep it very bright inside. 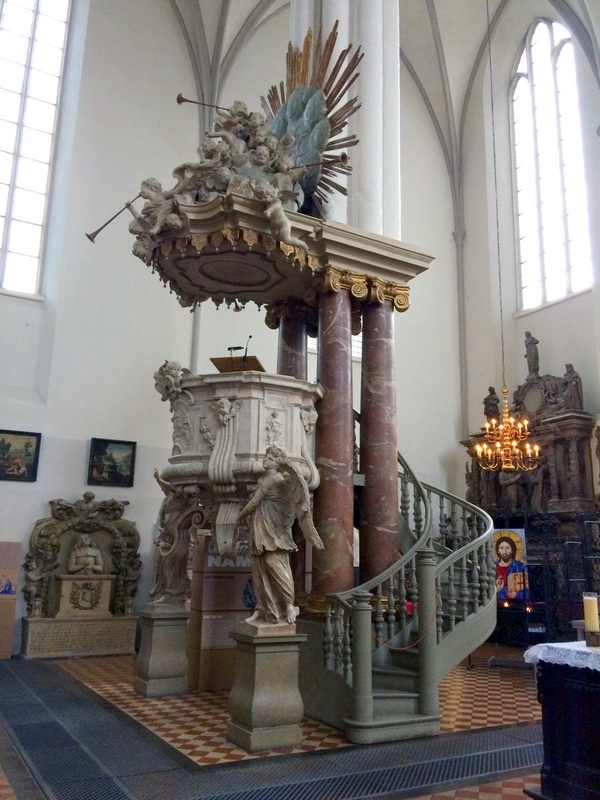 The speaking pulpit is quite grand. 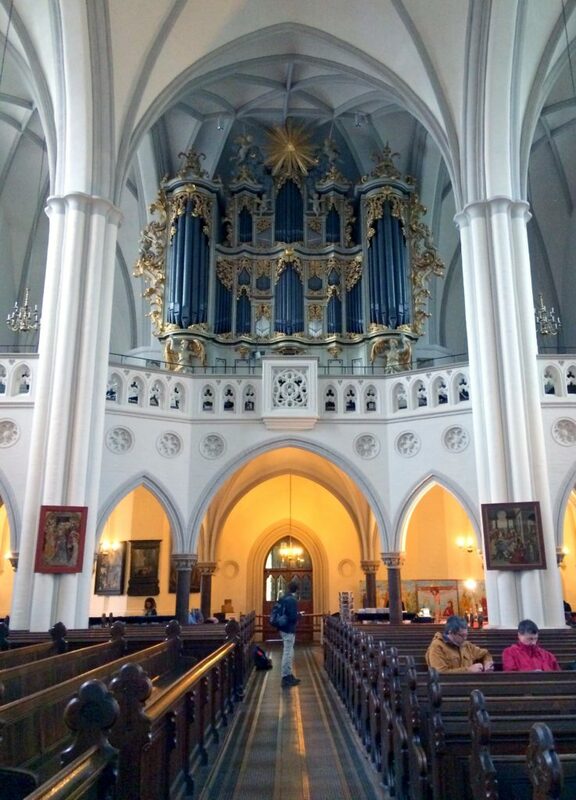 And so is the pipe organ. Here is the alter area. I’m not sure what this little memorial thing is all about, but it looks like the little cherub at the top is holding a club over the man’s head. Also, there is a lot of wheat in this memorial for some reason or another. If anyone knows what this is all about, please leave some details in the comments. 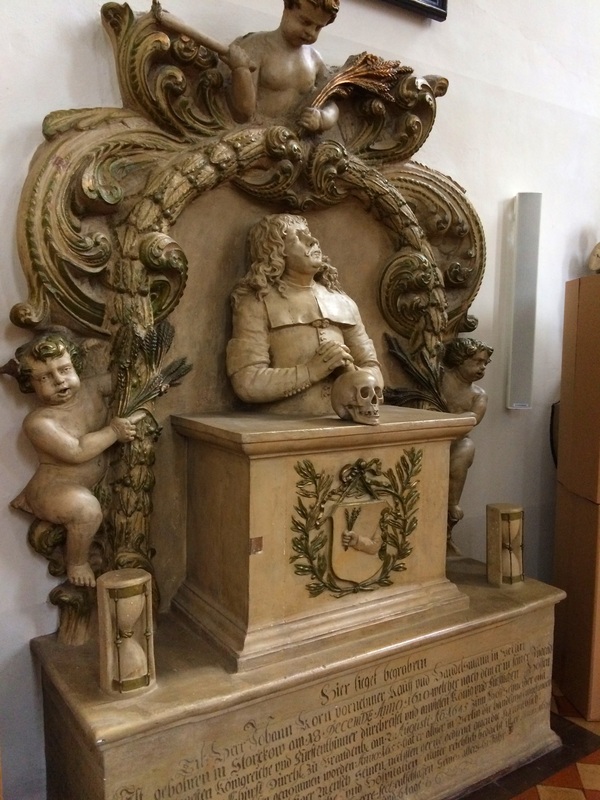 Here is another strange thing that stood out to me in St. Mary’s Church. 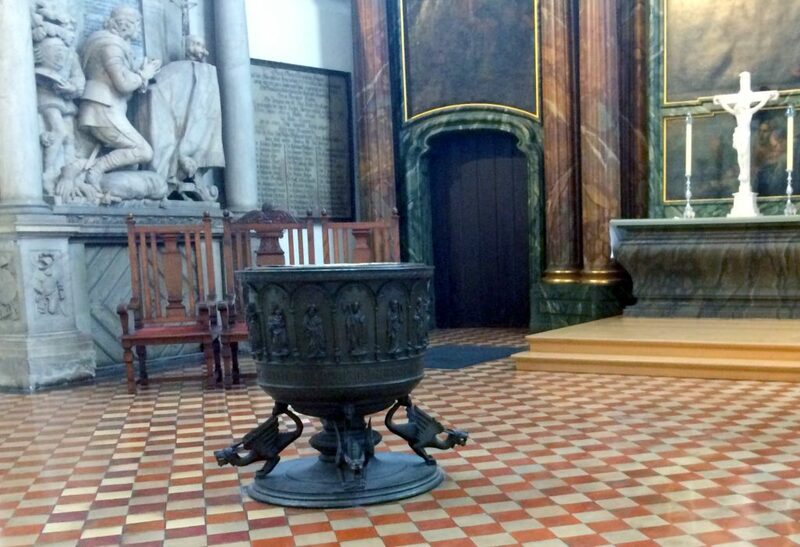 This baptismal bath thingy has dragons or something similar prominently adorning it. That struck me as odd, but that was probably common in Europe long ago. 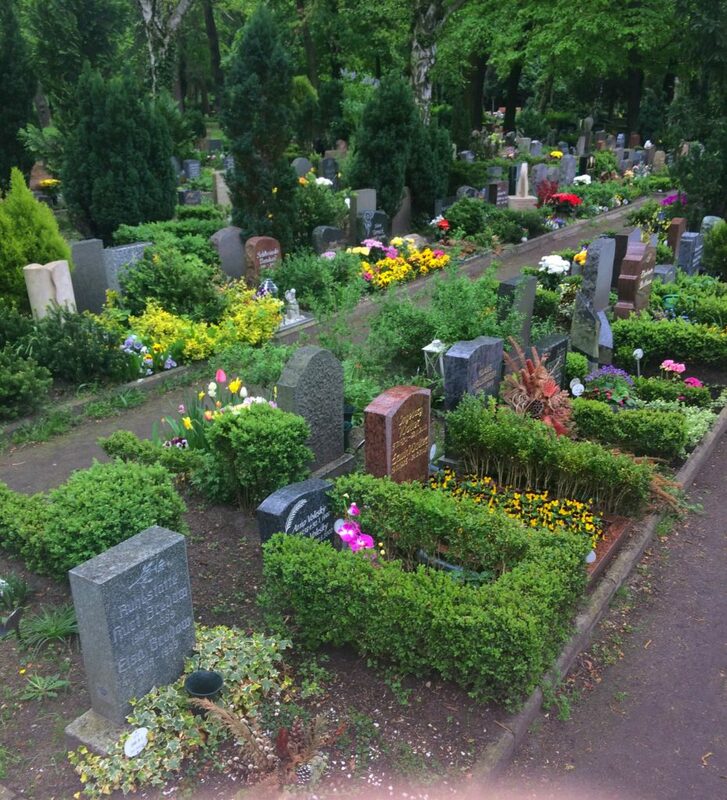 This was a cemetery that I walked by several times on my way to and from the conference. I walked through it one day and took a few photos, since it wasn’t like cemeteries in America that I’m familiar with. The plots were quite small, but they were all beautifully kept and tended. Then along the outside, there were large plots. some were nicely tended and some looked like they had not been touched in a hundred years. Okay, I’m finally down to the last several photos from Berlin. I just have a few miscellaneous things to point out and then we will be all done exploring Berlin. One thing that I immediately noticed about Berlin is that they have amazing public transportation. I used the bus system, the tram system, and also the subway system while I was there. They were all reasonably priced and I also noticed that they were all very clean. So don’t be afraid to use them while you’re in town. I also noticed that a lot of locals ride bicycles, as you can see in the photo below. At just about every major intersection, the bicyclists seemed to stack up almost as much as the vehicles. I also noticed several vendors renting bicycles to tourists. 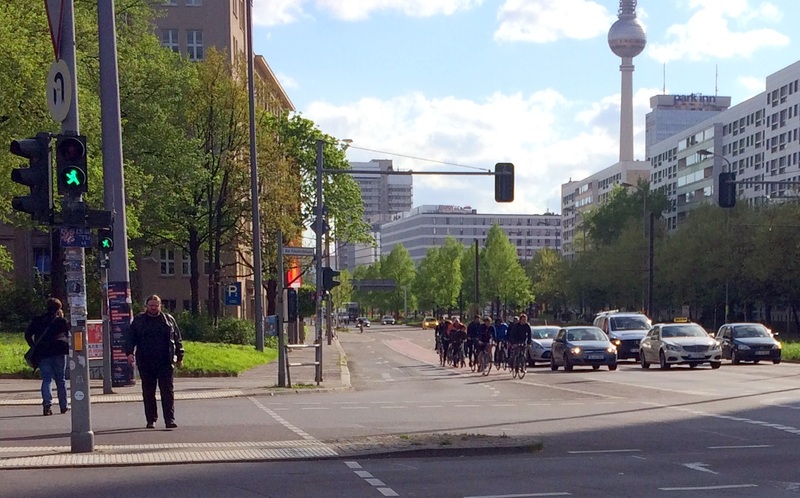 It looked like most of the roads were laid out with bicyclists in mind, so Berlin is definitely a good city to explore on a bike. 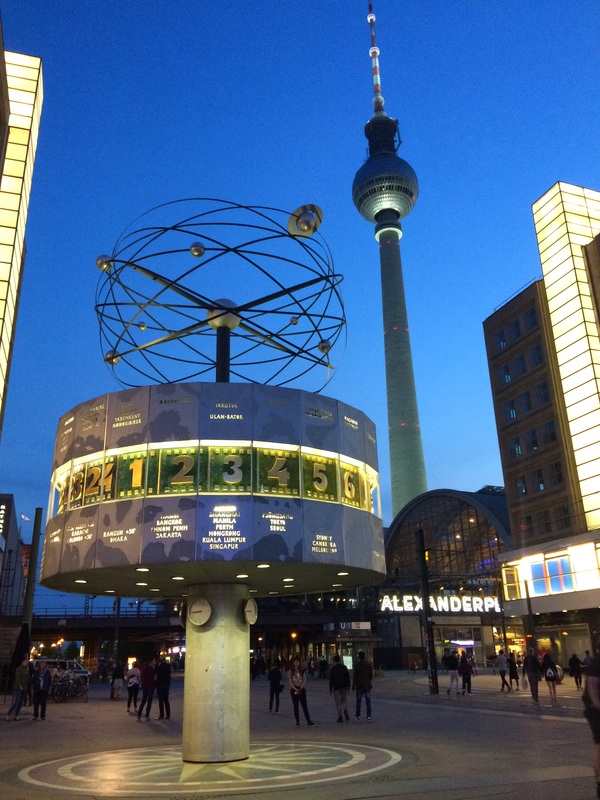 This photo shows a pretty cool world clock situated in the public square. It shows the current time all around the world which I thought was pretty interesting. I didn’t have the time to take a boat tour, but the city of Berlin has the Spree river cutting right through its heart. And Berlin hosts tons and tons of river cruises, which I’ve heard are pretty fun to experience. This building was just amazing. I don’t know what it was and I didn’t have time to explore it, but it just blew me away. This in in Potsdamer Plaza. 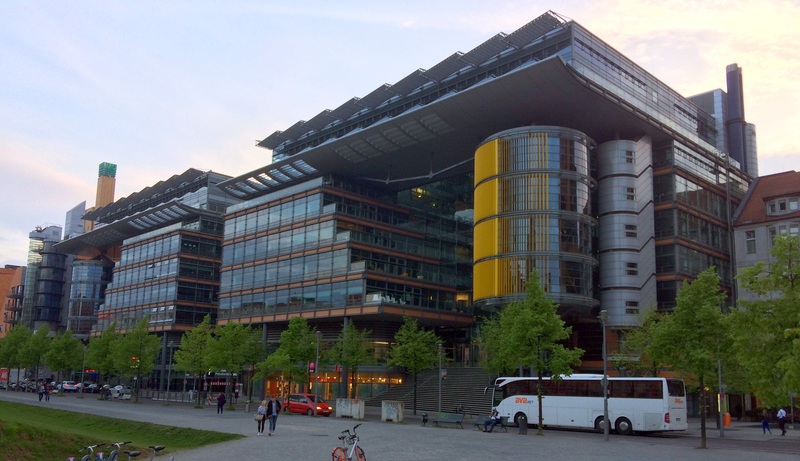 Also in Potsdamer Plaza was this gigantic circus-tent-looking structure called the Sony Center. It’s pretty crazy. It’s basically a mall inside with several stores and shops and restaurants and even a hotel. It’s an open air design, as you can see from the photo, but with a very big and impressive tent-style roof made of glass and steel. This photo is just for fun. 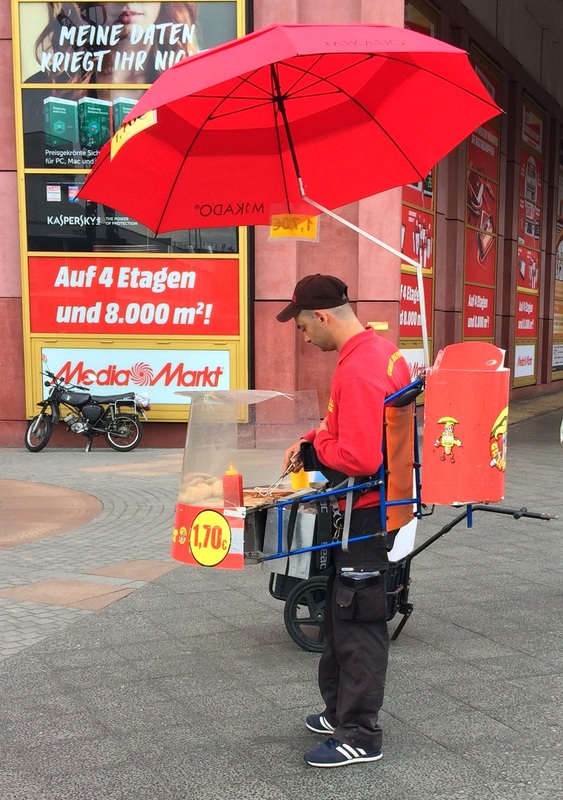 I didn’t see a ton of street vendors in Berlin, but this guy had quite a mobile setup going. It made my body hurt, just seeing him carrying around all that weight, though. 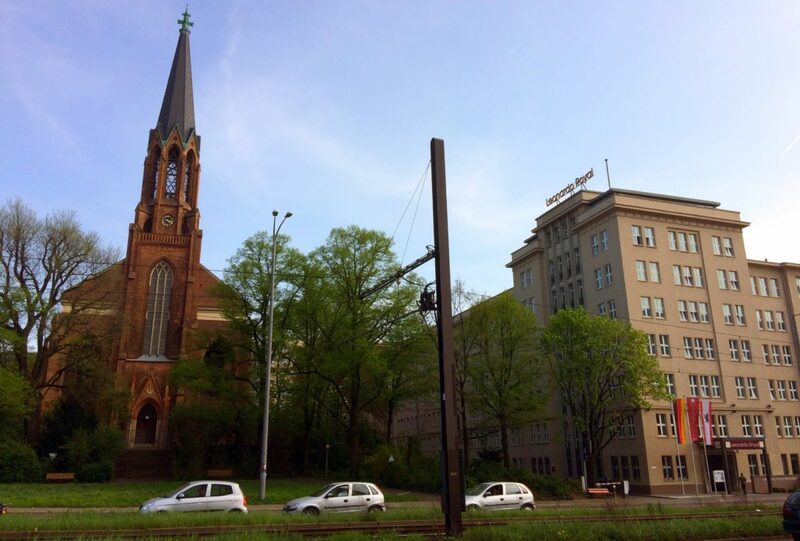 Here is the hotel that I stayed in and the church adjacent to it. It was the Leonardo Royal Hotel. It was a pretty nice hotel. I would probably stay there again. Literally right outside my hotel lobby in the middle of the sidewalk, was this little unassuming memorial embedded into the cobblestone sidewalk. 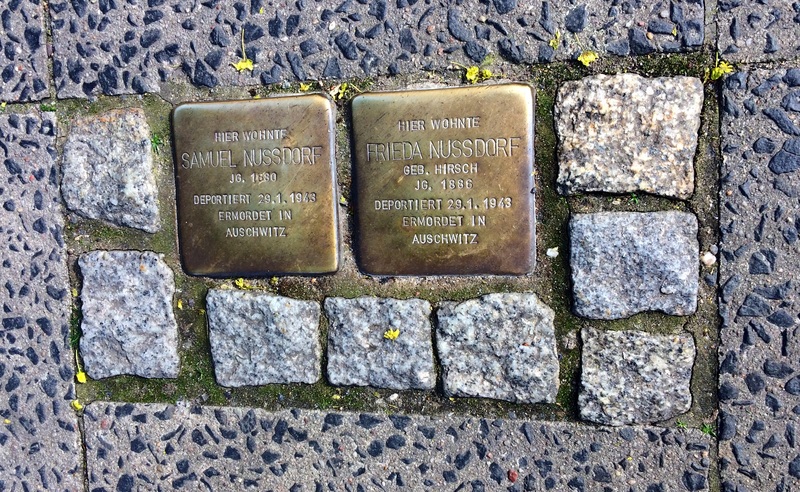 I googled it and found the Stolpersteine (stumbling stones) project. The project commemorates people who were persecuted by the Nazis. There are more than 7,500 of these little memorials installed around the city! Amazing! The plate on the left says: Here lived Samuel Nussdorf, born 1880, deported 29.1.1943, murdered in Auschwitz. The plate on the right says: Here lived Frieda Nussdorf, maiden name Hirsch, born 1886, deported 29.1.1943, murdered in Auschwitz. These are nice little memorials to keep everyone who walks down this sidewalk aware of what happened back then. 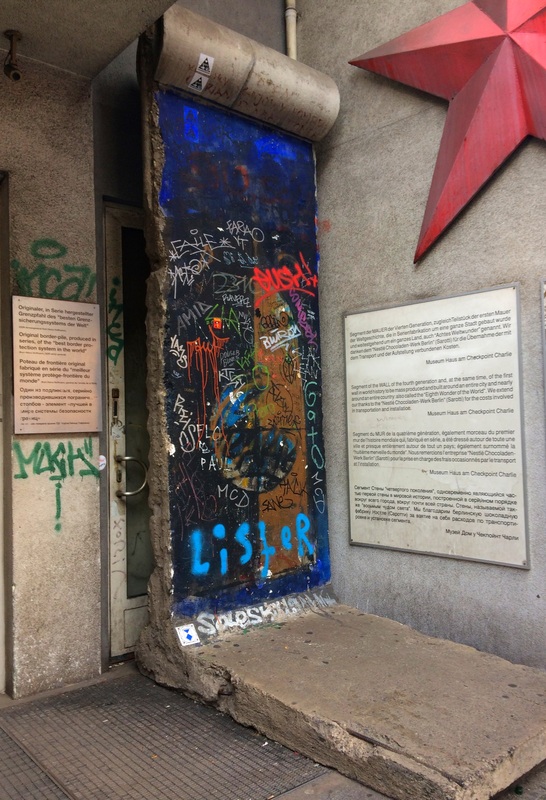 So much more to see in Berlin! Okay, so those were the areas of Berlin that I was able to see during my 3 personal days that I had available to explore on my own time. 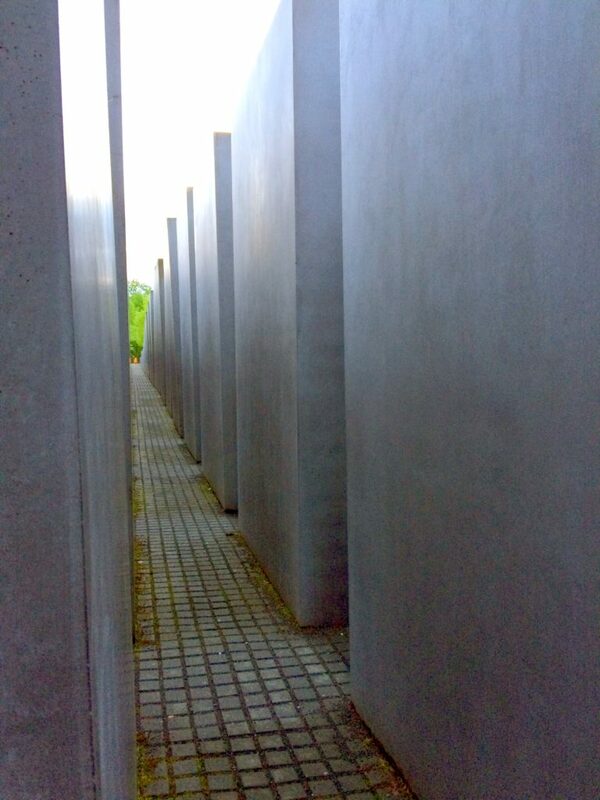 But there is so much more to see in Berlin! I really only scratched the surface! 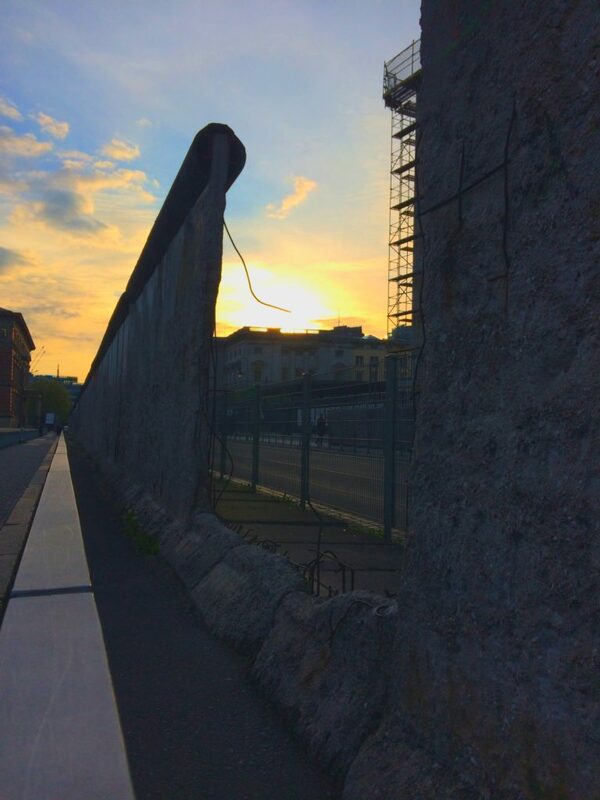 So enjoy your stay in Berlin and go see everything that Berlin has to offer! And also feel free to comment below on things that I missed or things that I got wrong! But wait, there’s more Germany! Berlin wasn’t actually the end of the line for the personal portion of my stay in Germany. I was actually able to see some of the countryside too! Next time I’ll publish some details and photos from that experience! 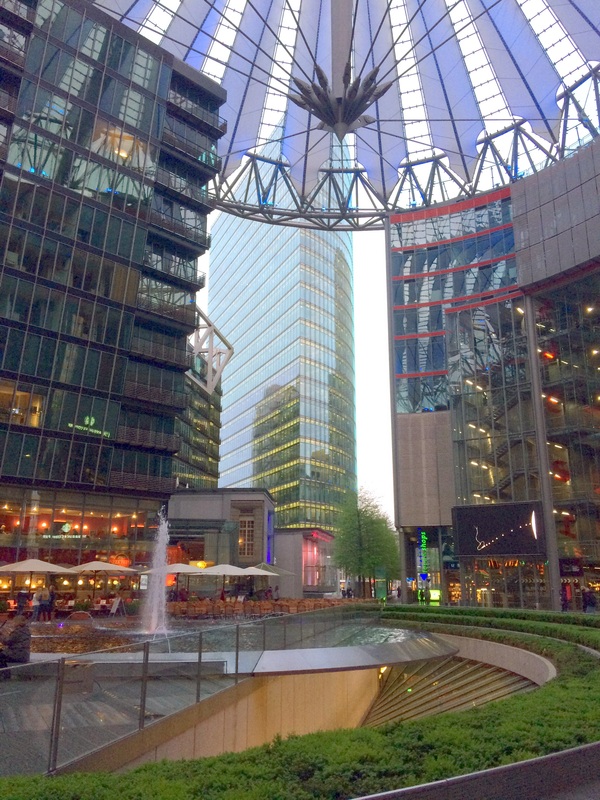 Last week after speaking at a software developer conference in Berlin Germany, I had the opportunity to take several personal days while there and I got to see quite a bit of the city! It was pretty amazing! 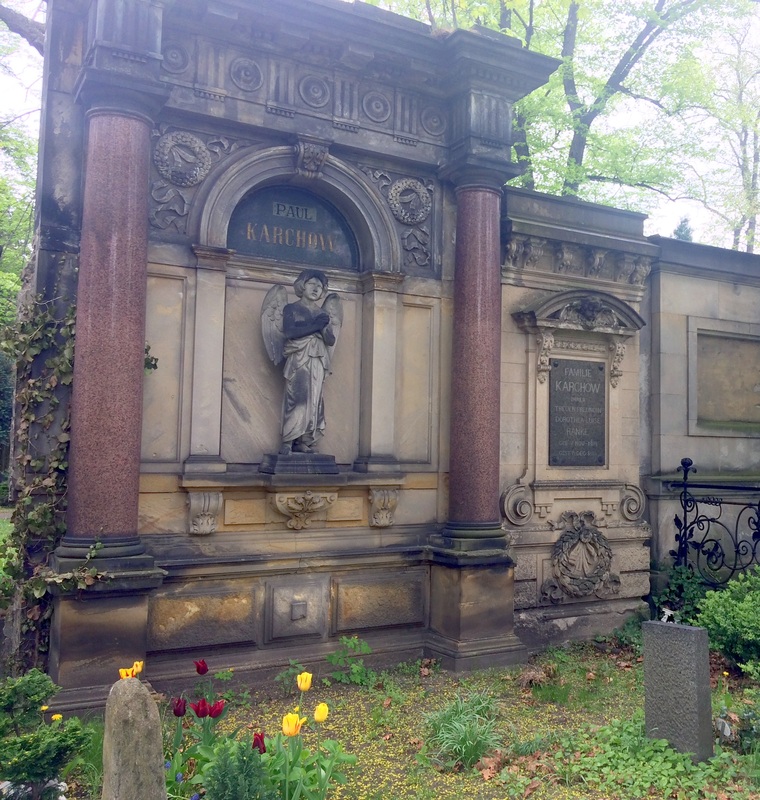 There was so much to see and do in the city of Berlin, that I can’t fit it all into a single blog post! So welcome to part 2 of Berlin sights! 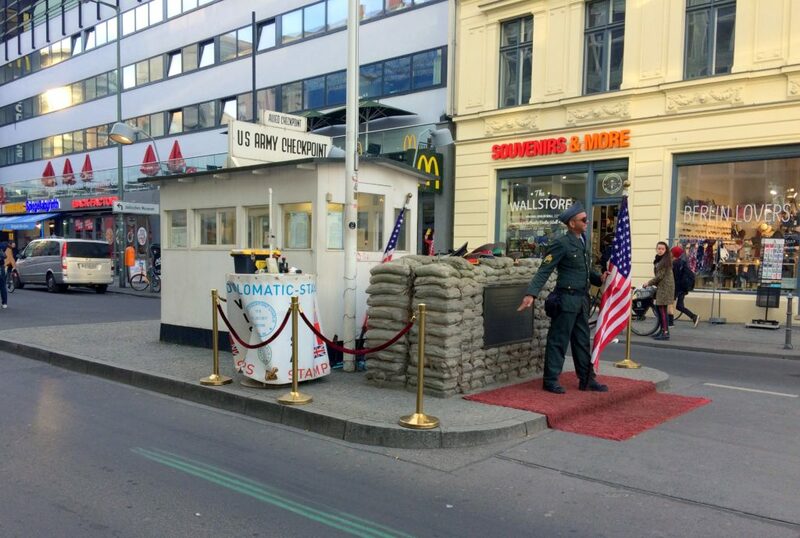 Checkpoint Charlie (or Checkpoint C) was a famous crossing point between East Berlin and West Berlin during the Cold War. 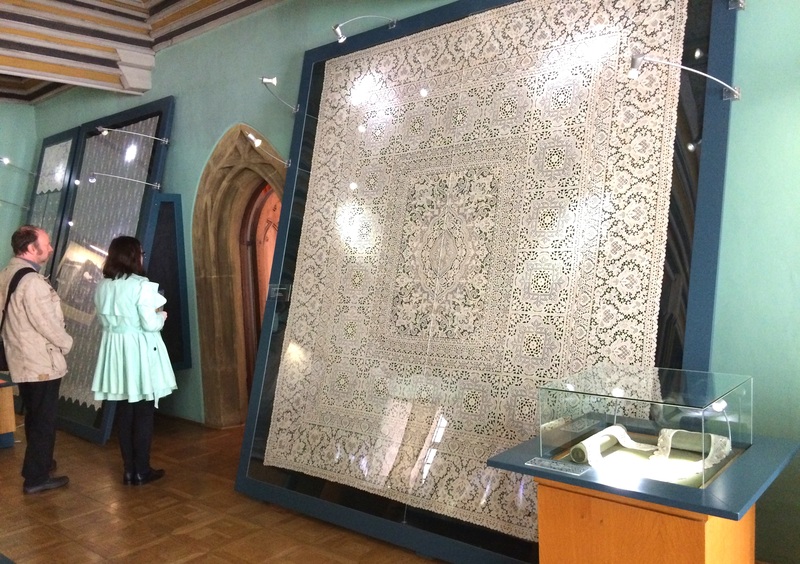 The original booth is on display in a museum, but a copy of the booth is situated on the original site for tourists. Along with Military Police actors posing for photographs. Only one block west of Checkpoint Charlie is a memorial or a monument to the Berlin Wall. 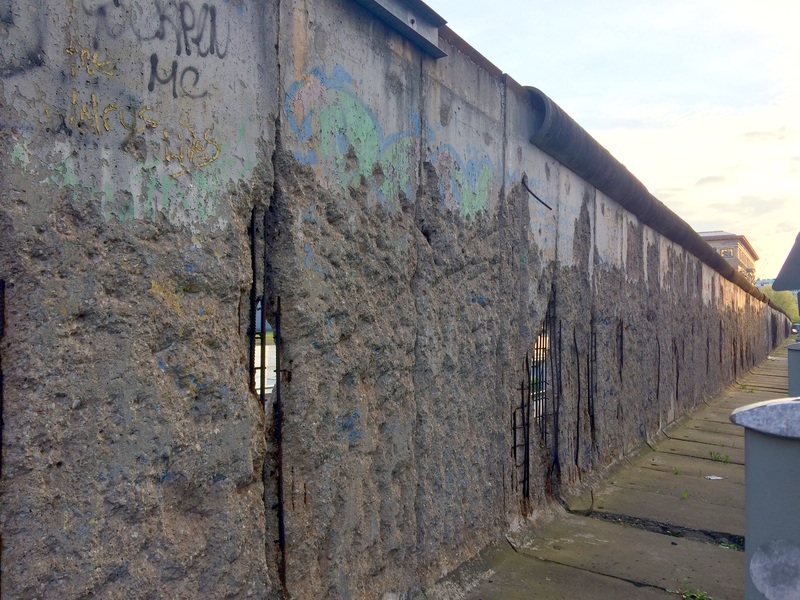 It is a 200 meter (650 foot) long section of the wall that was never torn down and is now protected by a fence. Although the wall was torn into and chipped away before being protected as a memorial. 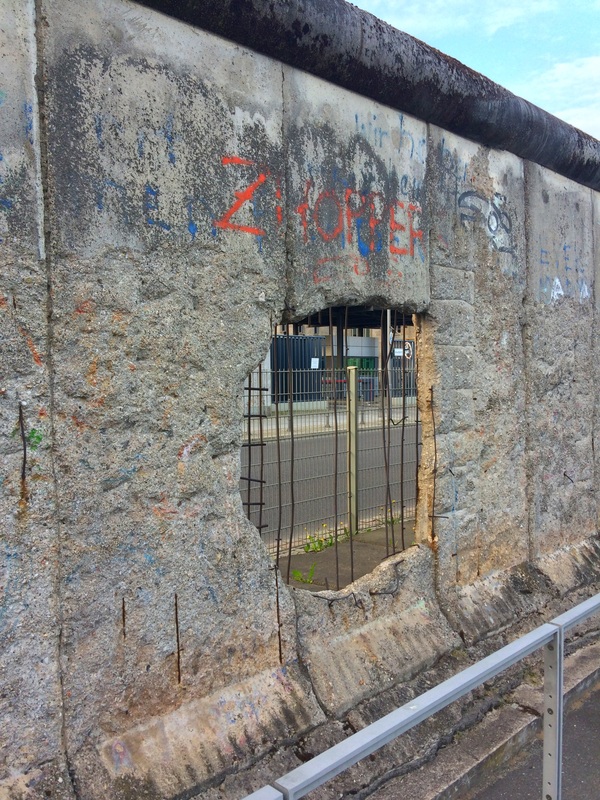 This is not the only stretch of the Berlin Wall that still stands, though. There are several throughout the city. Small sections can be found throughout the city on display too. 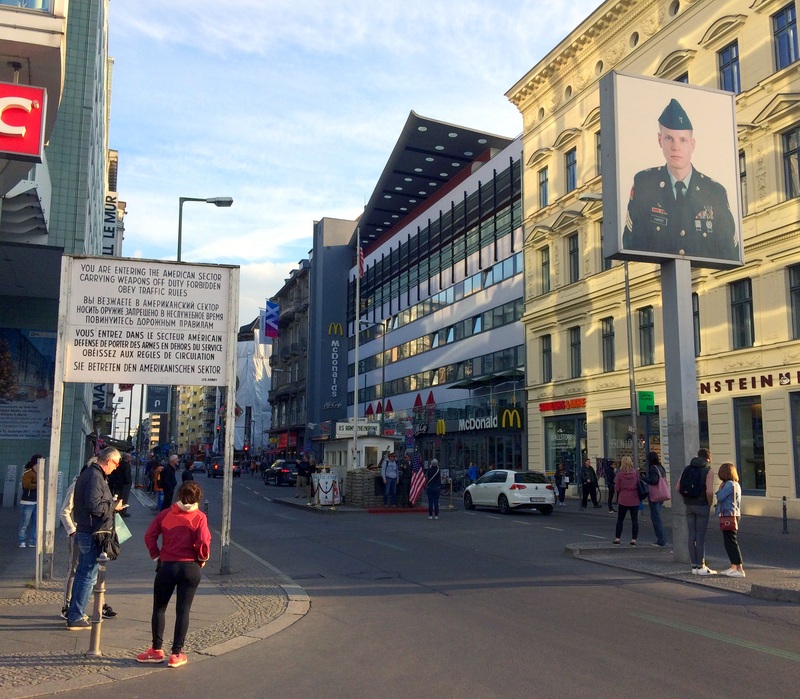 This one was just a block from Checkpoint Charlie. And this one was just across the street from Checkpoint Charlie. 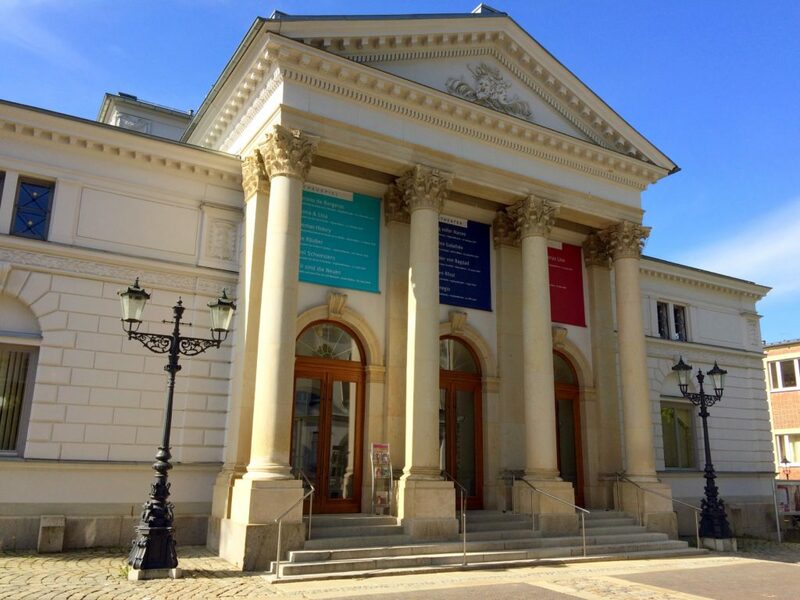 I dashed through the German Historical Museum in only 3 hours one afternoon, but you can easily spend an entire day going through all the displays there. It is laid out chronologically, so you can go quickly through time periods that you are less interested in and you can spend more time on other periods. I didn’t take a lot of photos inside. It was a bit overwhelming. Here is a 16th century book that I thought was pretty cool. 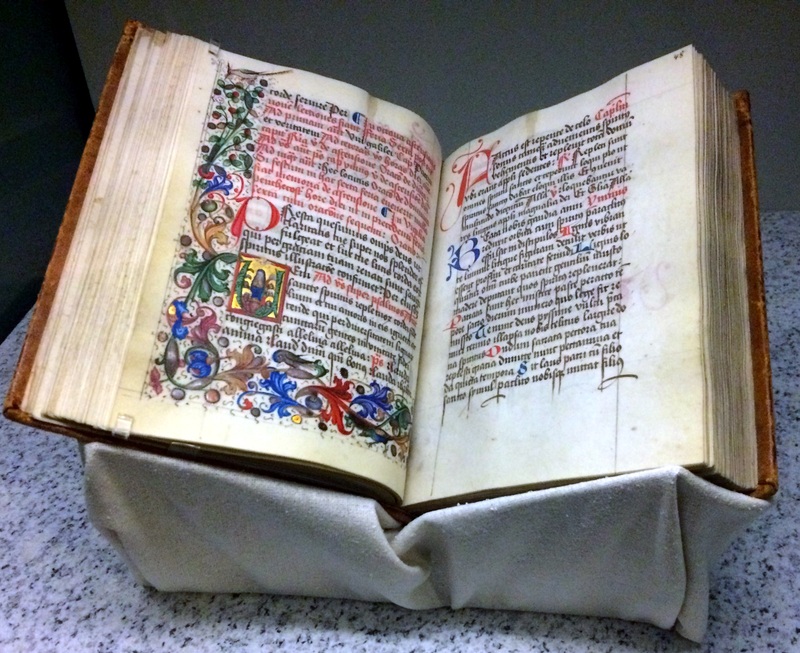 It was hand-drawn and hand-written on parchment. My phone camera and the dim lighting didn’t allow me to capture the incredible detail. Each page is a unique work of art. 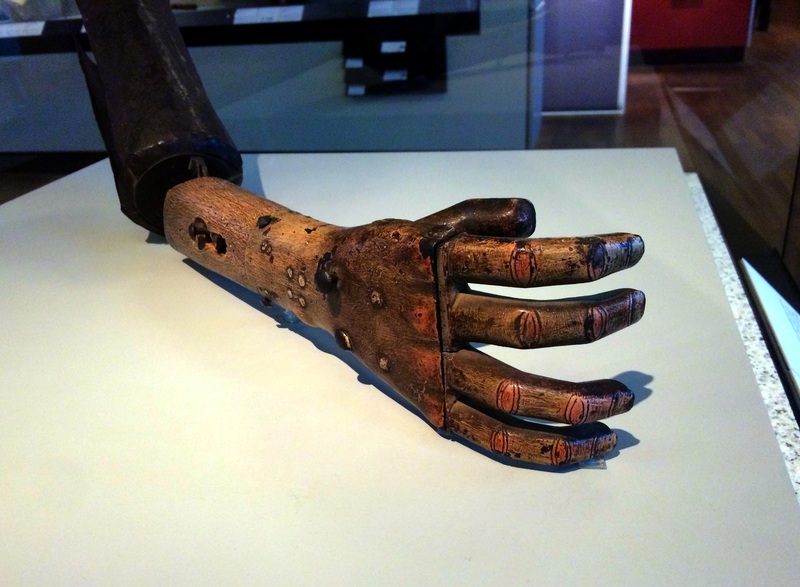 Here is an actual prosthetic arm from the 16th century. 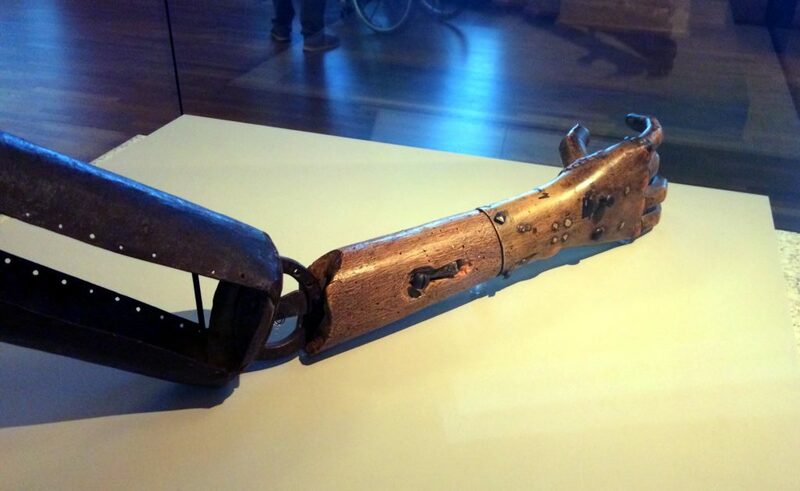 It’s made out of iron and wood. 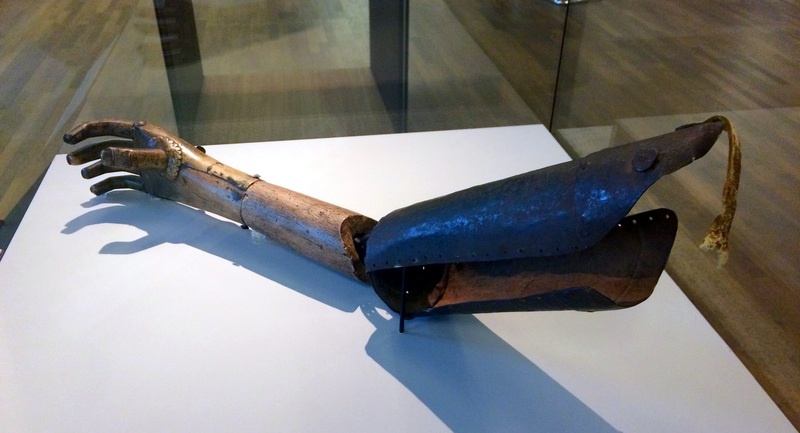 It was probably made for a high ranking knight who had lost his arm in battle. The elbow has 6 different positions that the wearer could set. And the hand has a button to move the index finger and middle finger, plus another button to move the ring finger and little finger. Pretty advanced! Here is a photo of 2 different light bulbs from the 1870s. On the left, Thomas Edison’s incandescent bulb. And on the right, Sir Joseph Wilson Swan’s incandescent bulb. Both of these inventors seemed to independently invent their versions around the same time period. And they integrated each others ideas into their own inventions. They even worked together for a while. I ran out of time by the time I got to the Hitler section and WWII and then the Cold War. I should have skimmed through some of the earlier history, because there are a lot of cool things to learn in the WWII and Cold War sections of the museum. Here is the ballot from the German elections on March 5th of 1933. Adolf Hitler called for this election shortly after he had been appointed as Chancellor. 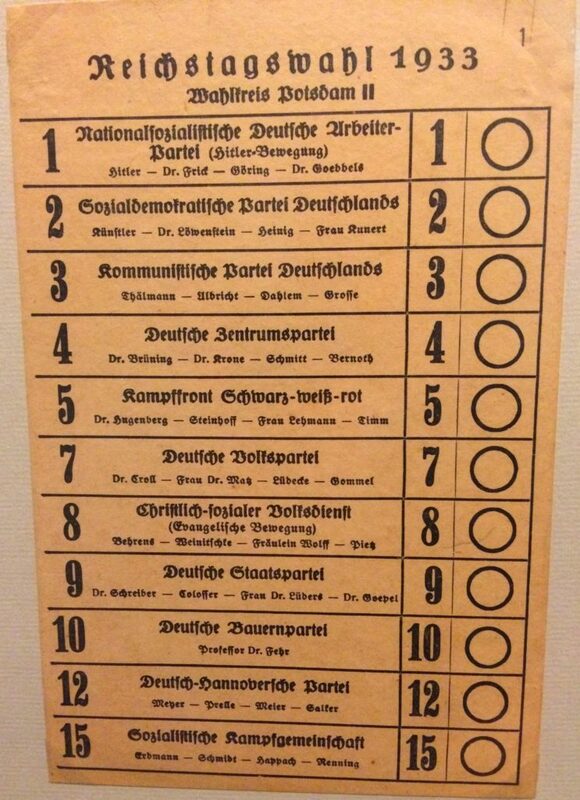 You can see that the voters had 15 different choices, and that the Nazi party was on top of the list. Here is one of the Nazi party campaign posters for this election. It says: “The Reich will never be destroyed – if you stay united and loyal”. 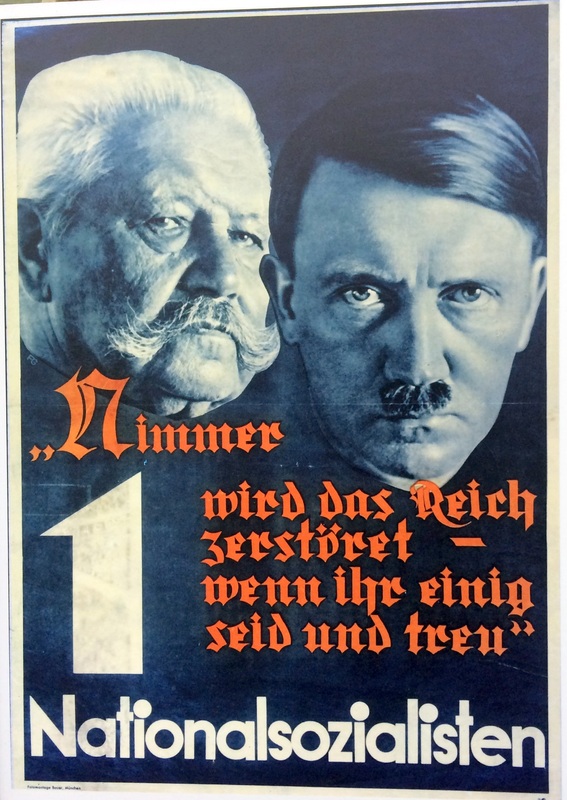 This poster blended the old Reich President (Paul von Hindenburg) with the new young Chancellor, while placing Hitler’s head subtly in the foreground. They had nearly 90% voter turnout for this election and Hitler’s Nazi party won about 44% of the votes. Just two weeks after this election, Hitler persuaded and intimidated other parties and was able to pass an act that effectively gave him dictatorial powers. Within a few months, the Nazis banned all other parties and dissolved the German Parliament (Reichstag). And the rest is history. Just one block south of the Brandenburg Gate, is a really interesting and creative Holocaust Memorial, or Memorial to the Murdered Jews of Europe. It covers an entire large city block … almost 5 acres. When you first enter the park and see the memorial, it appears to be just rows and rows of concrete slabs. The slabs look sort of like graves in a large cemetery. There are thousands and thousands of these concrete slabs and they are not all the same height. It’s quite beautiful. But then when you walk into the memorial, you quickly realize that the ground undulates up and down wildly as you get deeper into the interior of the memorial. The ground gets lower and lower. And the concrete slabs get higher and higher. Eventually the slabs tower over all visitors that explore the park. The mood of visitors turns to confusion, isolation, and even a little bit of worry. 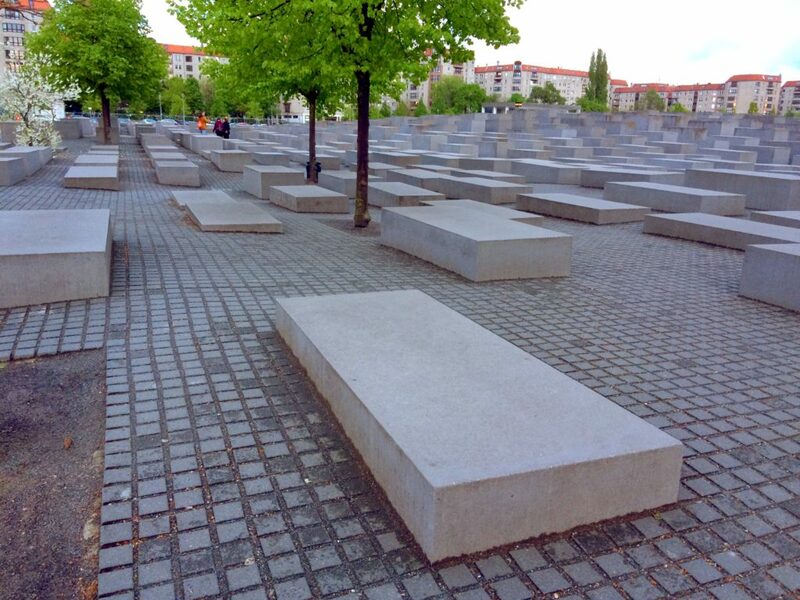 The artist who designed this memorial says that the slabs “are designed to produce an uneasy, confusing atmosphere”. It’s a unique experience. Buried under ground in the middle of the memorial, is an information center, but it was closed for the day when I was there. So I didn’t get to go inside. 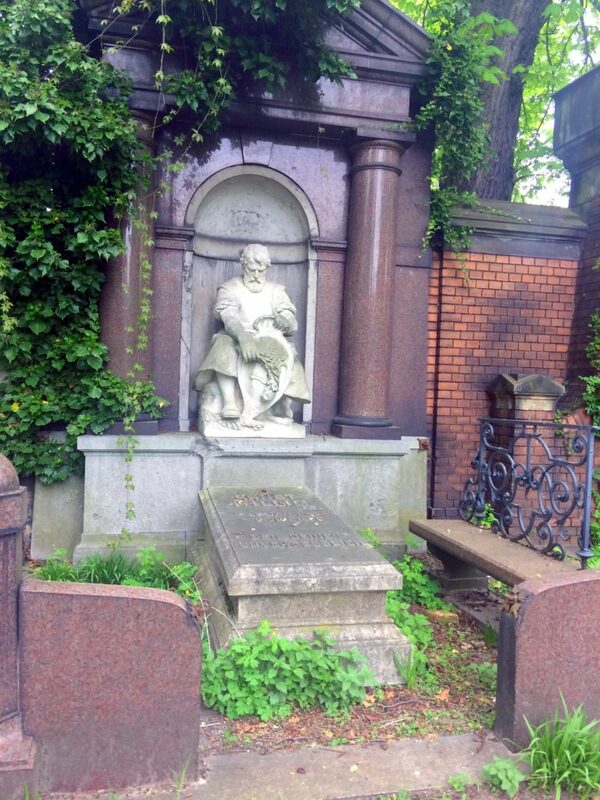 Next time I’ll publish yet another blog post showing even more of the fun sightseeing that I did in Berlin. 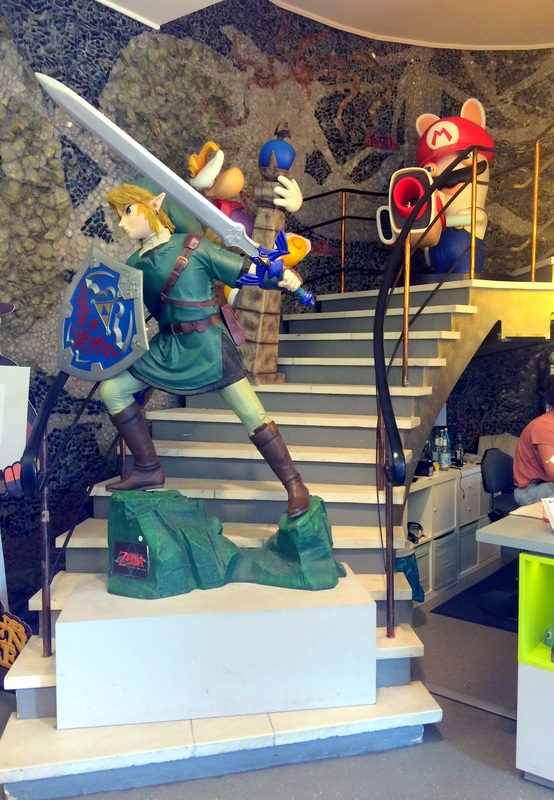 Because in 3 days I saw a ton of cool stuff and it won’t all fit into even two blog posts!